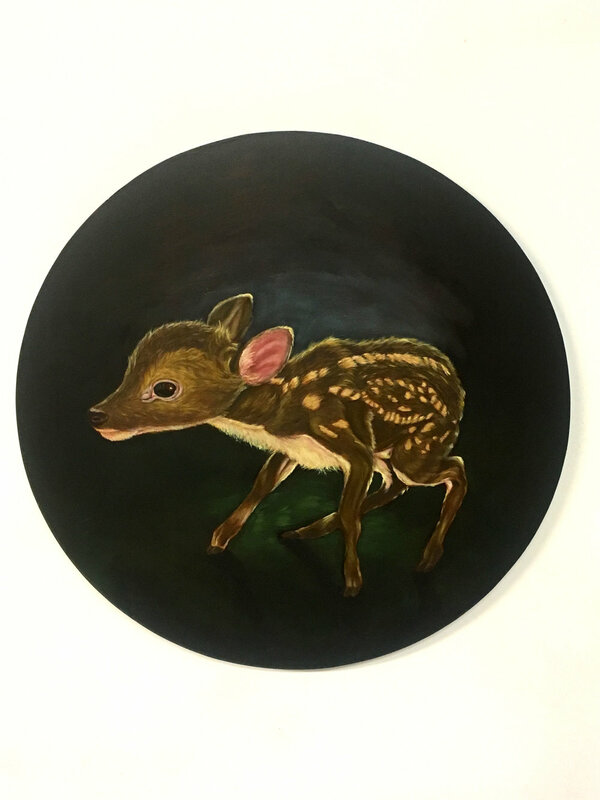 Working within the field of painting, Hayley Lander explores the coexistence of our species with 'nature.' Broken bricks, fragments of concrete and scattered gum leaves are intimately observed in her enquiry into the metaphorical capacity of still-life compositions. Elements of discarded construction materials are a prominent feature in her oil paintings, their solidity and tactility either dominate or sit in fragile balance with plant matter. A narrative slowly unfolds in The new nature; articulating the fragility of our ecosystem as species move toward their tipping points of endurance. 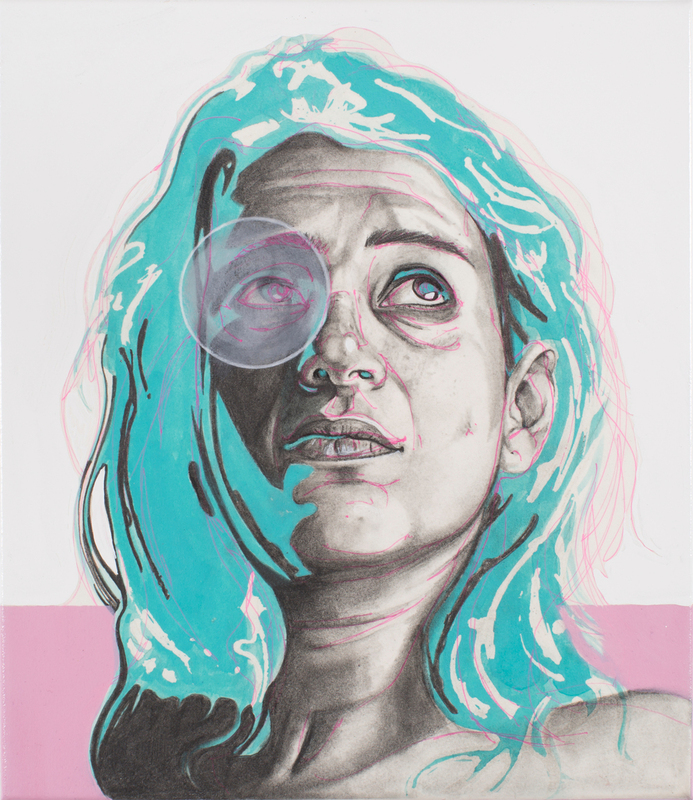 Hayley Lander graduated from the Australian National University in 2014, upon graduation she was selected as a finalist for both the Hatched National Graduate Exhibition and the Macquarie Group Emerging Artist Prize. Hayley Lander was recently selected as the emerging artist category winner of the 2018 Waterhouse Natural Science Art Prize. A Sense of Being is a representation and reflection on this constantly evolving and ever-changing state of being. In today's fast paced society, there is a constant need and want to tailor our lives, interests and lifestyle to reflect our perception of perfection, when the reality of situations can be far from this. 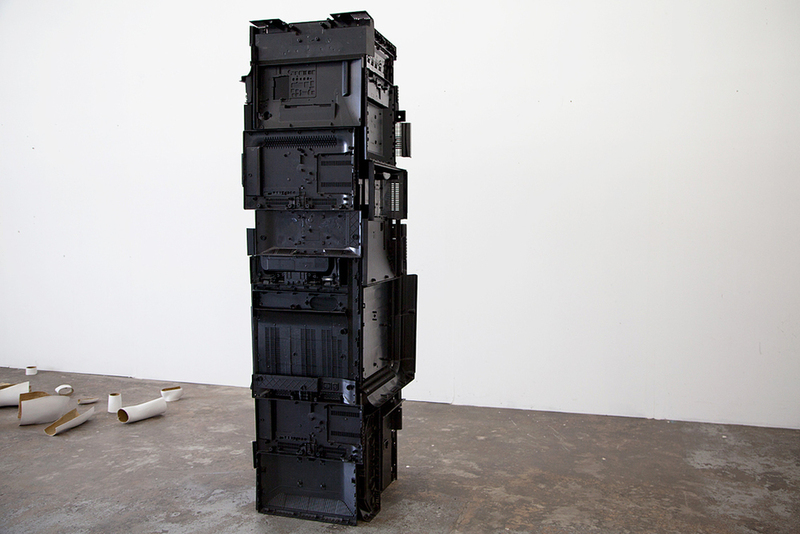 van Rhijn explores the notion of picking or selecting elements of society to 'build' or ‘construct’ ourselves. A Sense of Being does not oppose this fluidity and movement, but merely draws attention to it. 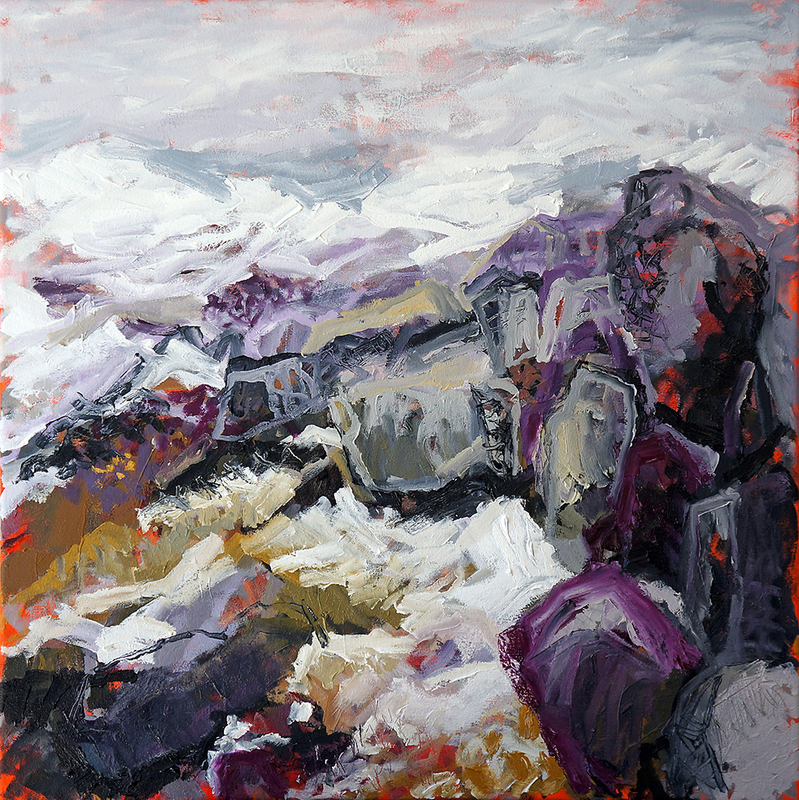 The works in this show are derived from Julia’s recent residency in North West Iceland. For two months Julia resided in Blöndúos at The Icelandic Textile Centre. The location lies at the confluence of the river Blanda and Húnaflói bay. Through these works Julia aims to capture and transfer the reverberations and rhythms she experienced in the landscape onto textile. 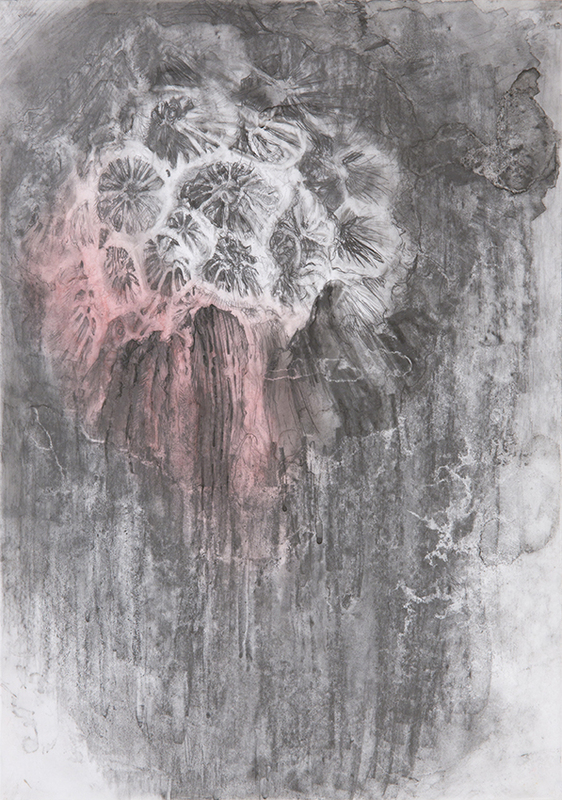 The works in this show are derived from Martin’s recent series – Stilled Life, Illumine and Work of Human Hands. Through these works Martin explores themes that have become apparent in the digital age; exclusion, isolation, voyeurism and loss of traditional skills. 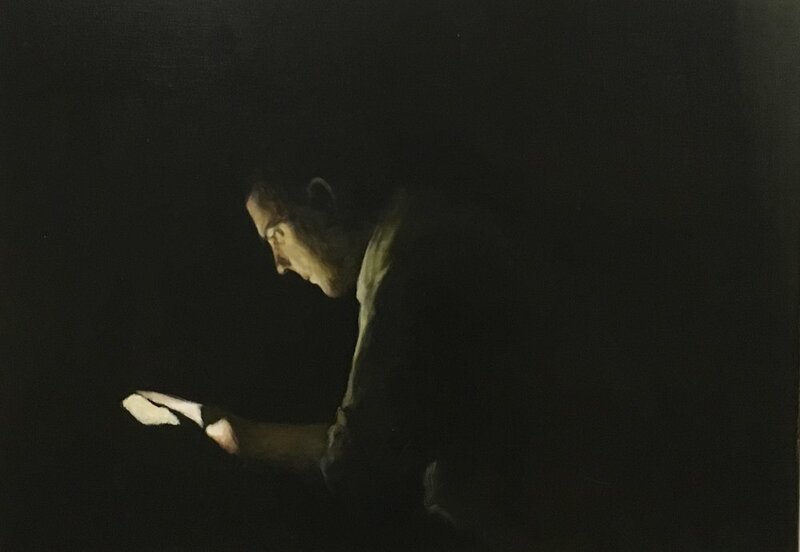 Martin’s painting clearly reference the old masters, his use of subtle and direct light sources, along with muted colour and deep shadow, create a sense of mystery and ambiguity. Michelle Stanic’s photographic practice is inspired by the everyday, endeavouring to capture simple moments with a modern contemporary lens. Alt Pause was born from the artist’s interest in finding an ‘Alternative’ view by ‘Pausing’ to see and documenting that which is not always obvious and that which can be found through a mindful perspective. A growing passion for photography has led her to curate a body of work that she has developed over five years. The subject matter she presents emerges from serendipitous discoveries on her travels locally and abroad celebrating and contrasting natural and man-made, permanent and ephemeral. Stanic spent more than 30 years in the fashion industry, working in senior creative and commercial roles for some of Australia’s most iconic brands; including Saba, Witchery and Myer. She studied Art and Design in the early 90’s and completed her Masters in Business in 2011. 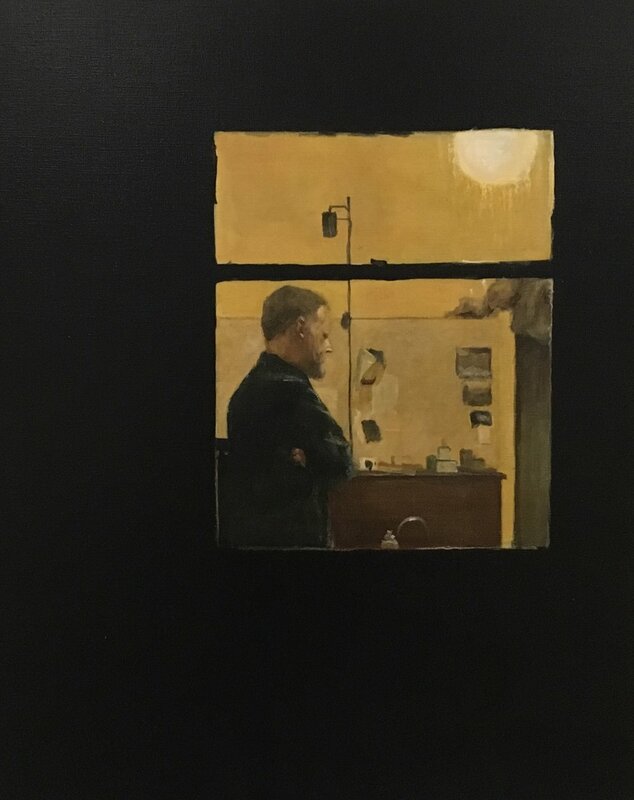 Many of the works put forward in New Paintings have been influenced by Kerley’s response to the violent aspects of gay social history and the equivocal position of gay men within society. 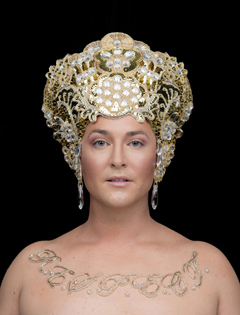 Kerley’s narratives allude to homosexual experience. Unassuming, eerily peaceful scenes are created though manipulation of composition and colour. The spaces represented in these works, such as parks and public toilets, have enabled gay men to enact upon their sexuality while simultaneously jeopardising their safety. This ambiguity of meaning between threat and fulfilment reflects the contradictory positioning of, and ambivalent societal attitudes towards, homosexuality. Michael Sibel’s exhibition at Gallerysmith Project Space showcases his interest in the figurative. Neither male nor female, the figure is a guardian and vessel, a universal symbol of all that we have come from in a reduction to the simplest of forms. The figure is raw, even primal, and focuses on a dynamic link between an intrinsic, instinctive impulse and our controlled modern life. 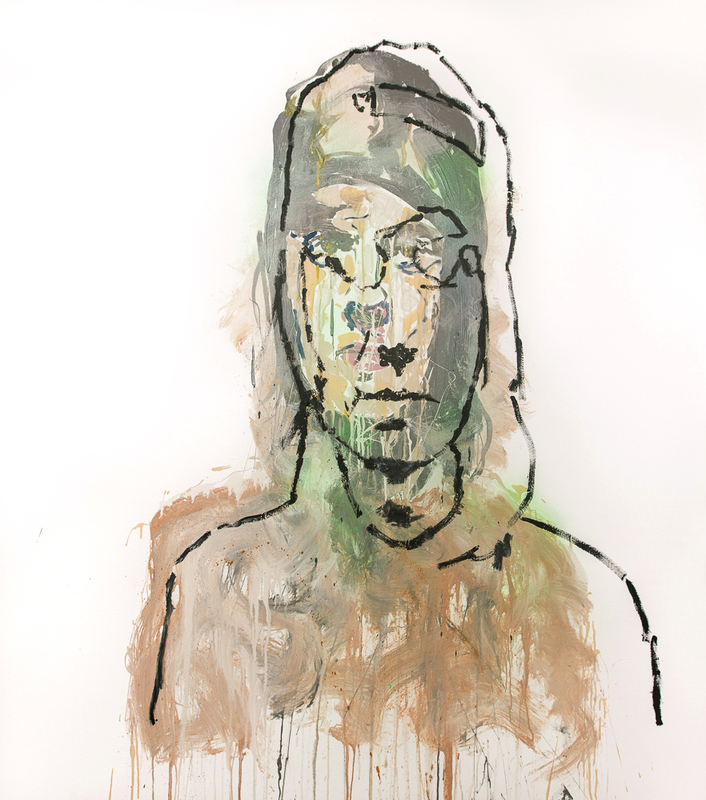 Evading literal representation, Sibel focuses on our flicker of recognition to the figure. These sculptures aim to pose more questions than answers through an undercurrent of otherness juxtaposed against the likeness we share with these pieces. Graziela Guardino’s practice is characterised by an ongoing interest in the purity of colour and light, emphasised by her choice of medium and process. Through the layering of transparent and translucent acrylic and oil paint glazes Guardino creates simple, ethereal compositions. The Subtlety of Colours creates quietness, a space to attentively absorb and become lost in delicate hues in this body of work. Brazilian born Australian artist, Graziela Guardino has studied at NAS, Julian Ashton Art School and UNSW Art and Design before completing her Master of Arts (with Distinction) at RMIT University in Melbourne(2017). 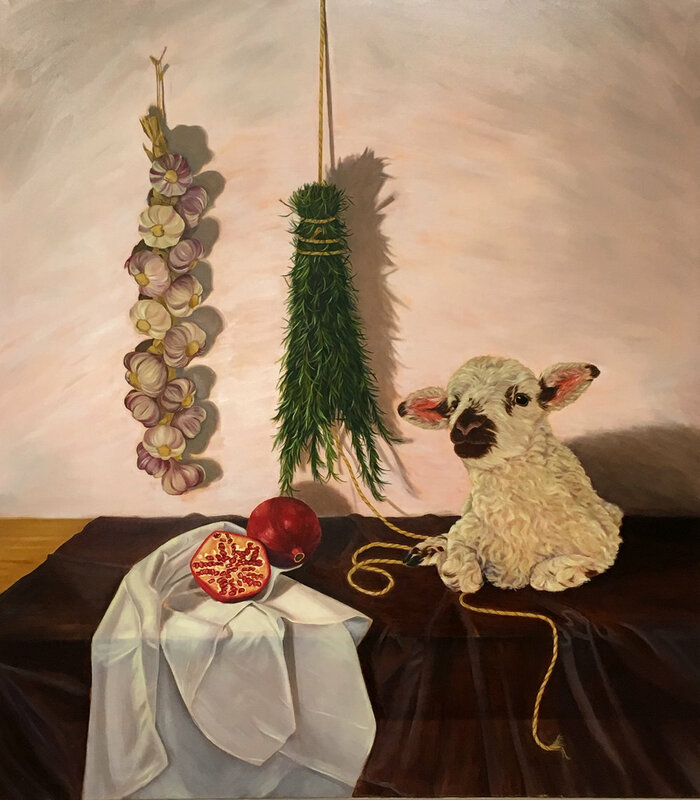 Graziela Guardino has exhibited in Australia, Brazil, Hong Kong and Singapore, and was a finalist for a number of prestigious art awards including The Churchie Emerging Art Prize, Muswellbrook Art Prize and the Fisher’s Ghost Award in Australia. 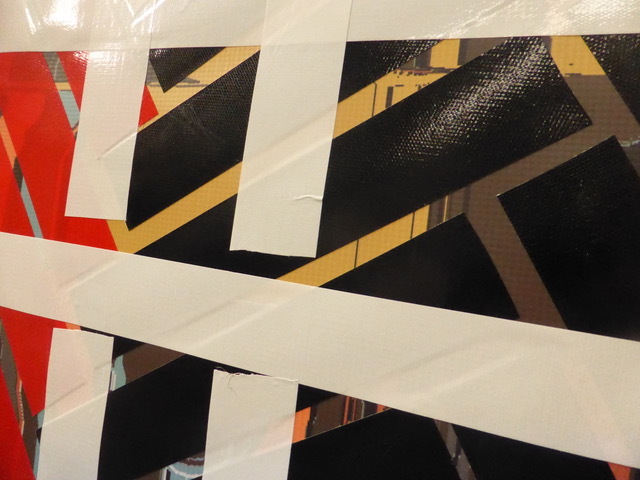 Sally Tape is a Melbourne based artist who investigates links between architecture, minimalism and movement. 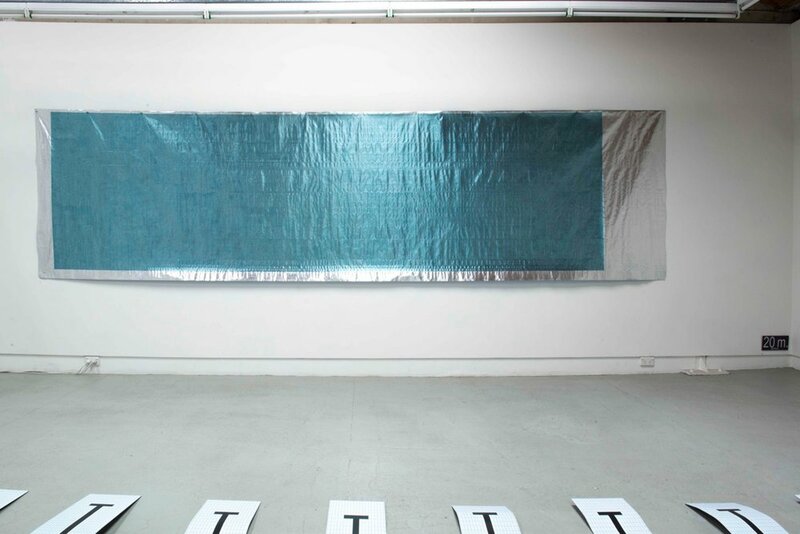 Working across painting, drawing and sculpture Tape’s practice is predominantly focused on the role the body plays with architecture and the experience of movement through topological space. ‘Solstice’ is an exhibition that explores the movement of light during the change of seasons. Inspired by the drama of light and the inherent patterns in nature, this show is a study of the ever evolving mood in a landscape. 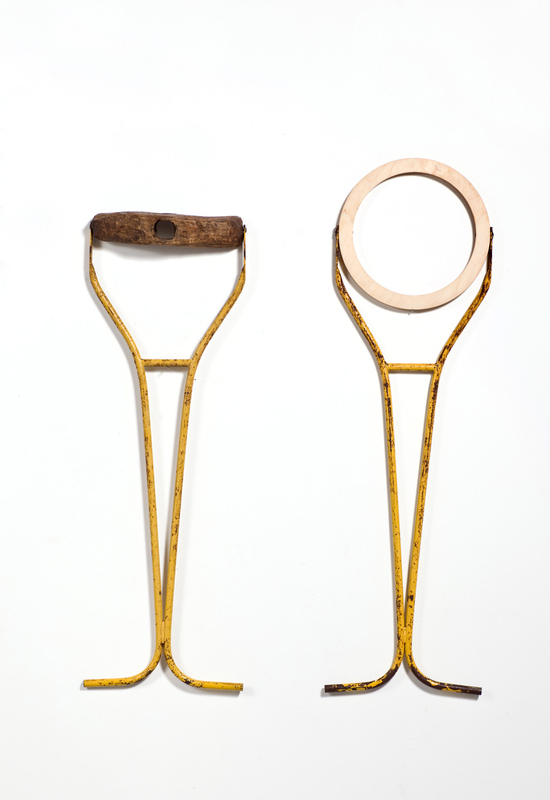 Debra Porch’s visual work for over 20 years has focused on the wider notions that question how the everyday can be transformed into the extraordinary through objects and devices that elicit or conjure up images of ones past that otherwise may have been hidden (or be invisible) from sight. Debra sadly passed away on December 14. Close to Krieger's heart is the vulnerability of animals and the transient nature of life. 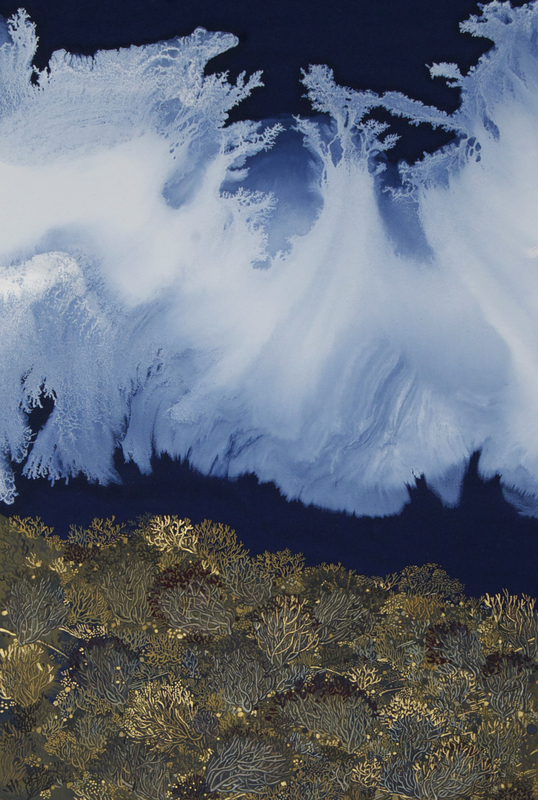 Her body of work explores how human activity has affected Australian wildlife today. Through deforestation, fossil fuels and introduced species we are rapidly damaging our eco system. Beauty and the Macabre displays both the positive and negative changes that have been made through our own doing and undoing. Extinction and climate change are the ugly elements of our intervention, but there's also stories of survival and rejuvenation through programmes to save our endangered species. Influenced by the movements of the Vanitas and Momento Mori, Krieger chose not to delve too deeply into death and decay but produced a body of work implementing her own arrangements of unstill life. Her paintings display collections of Australian flora and fauna, including the living, extinct and endangered. The viewer is firstly drawn to the beauty of the work, only to question its inference. Up North is a diary through objects of the time Claire McArdle spent as a resident artist in Blönduos, Iceland. The works investigate how the people influence the landscape and how the landscape influences the people. Why do you always see sheep in threes? How do you souvenir a mountain? What is a blueberry? Her research investigates existence in a climactically harsh environment, how we keep mementos of a place and how human demand and location influenced the idea of the 'blueberry'. 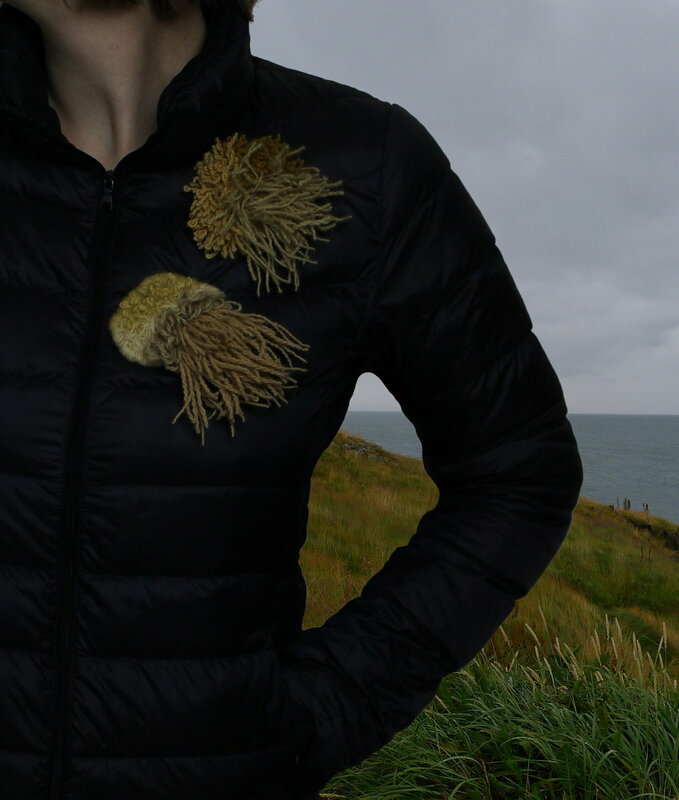 The work utilises local materials including fish skin and Icelandic wool which Claire dyed from plants in the Blönduos area. 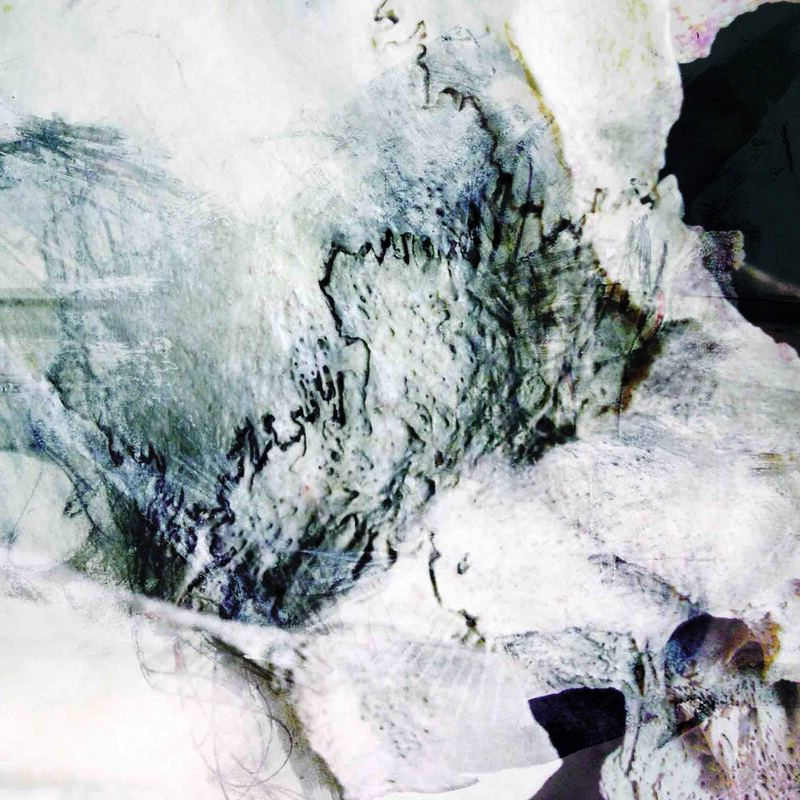 Claire has held nine solo exhibitions including two overseas this year in Estonia and Germany. Her latest solo exhibition Up North will travel to Gray Street Workshop in Adelaide, The Lost Ones Gallery in Ballarat and then Gallerysmith Project Space in Melbourne later this year. Her work has been exhibited in Thailand, Hong Kong, USA, UK, Germany, France, Estonia, Austria and The Netherlands. She has undertaken residencies in Australia, Mexico, Iceland and Estonia. She won first prize at Contemporary Wearables '13 and the National Contemporary Jewellery Award in 2016. She curated an exhibition of 31 Australian and Estonian artists, presented in Melbourne and Tallinn. She is the Co-Director of Radiant Pavilion. 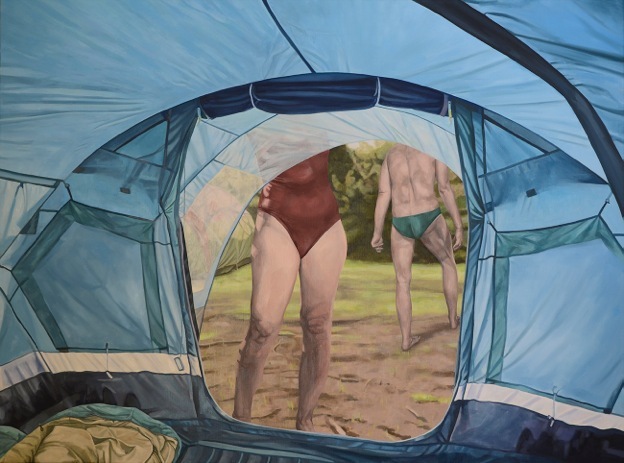 Phillip Allan's paintings depict figures and tents associated with the narrative of holidays, the proximity of water and activities associated with swimming. 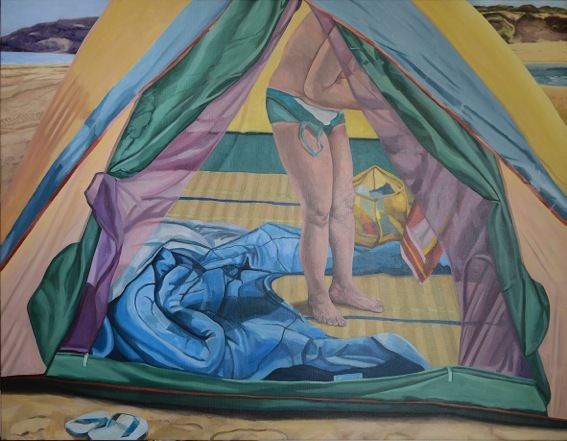 Within these paintings tents are temporary structures providing basic shelter, amenities and privacy. 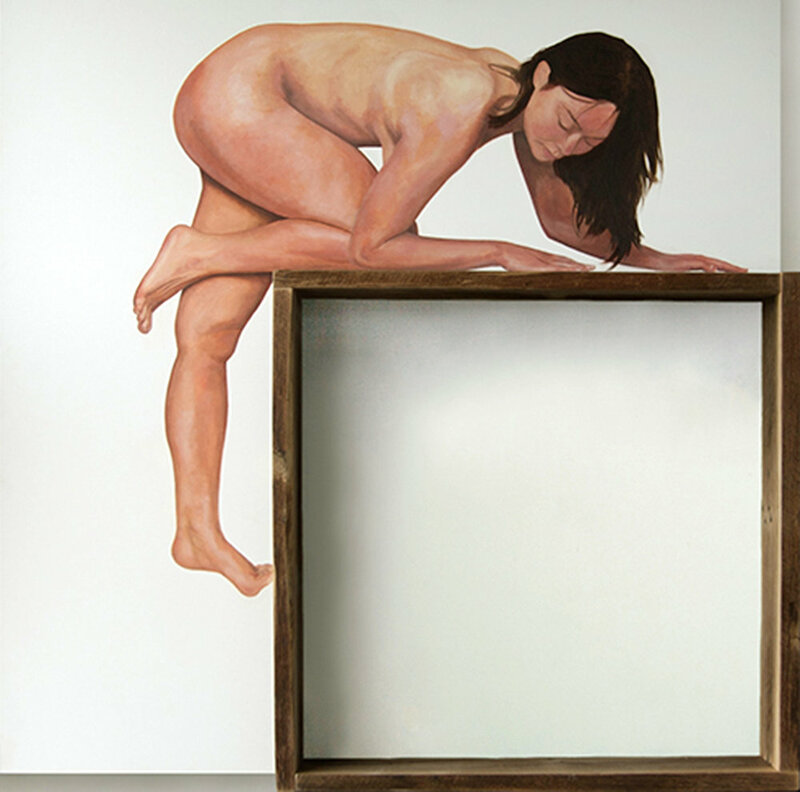 Figures are framed within openings of colour, textures and folds of polyester or nylon material. The figures present a limited narrative, like film stills, of people carrying out basic activities or suggesting an event that has just occurred. 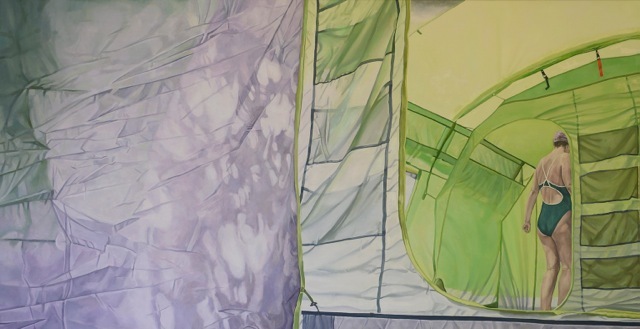 The fragments of modern tent design and texture provide elements of abstraction to combine with the figurative. Subverting artistic conventions of presentation and function, Stacey Korfiatis seeks to surprise and challenge her audience. Rejecting the notion of play as only for children, Korfiatis is driven to create innovative works that deliver experiences, a theme that permeates both her 2- and 3-dimensional works. Reimagining the 4-cornered archetype, Korfiatis' painting incorporates sculptural 3-dimensional elements to enable her exploration of the relationship between the subject and frame. Her works discuss issues of autonomy and empowerment in relation to the subject and the question of whether the frame exists to imprison or protect. Maintaining an active presence in Melbourne's art community, Korfiatis' work has been featured in a number of prizes including the 2016 Stanthorpe Art Festival and the 2015 Contemporary Australian Silver & Metalwork Award. In addition to making her own work, Korfiatis is always aiming to expand her practice and has worked as a studio assistant to jeweller Blanche Tilden and painter Matthew Quick. 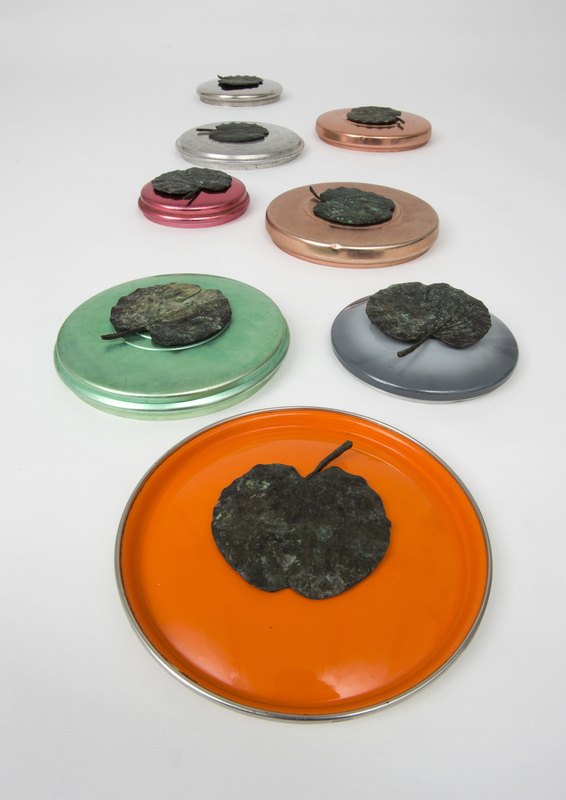 Stacey Korfiatis holds a Bachelor of Visual Arts (Metals & Jewellery) from Monash University. Belinda Street is a Newcastle based professional artist best known for her Australian Landscape Paintings. Street’s work explores the relationship between representation and abstraction, capturing the landscape in an expressive and gestural way. 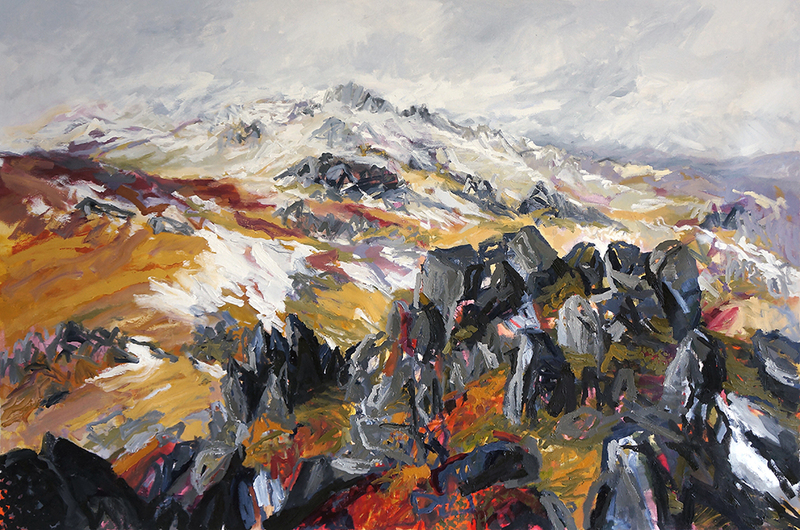 The Australian Alps in particular is a recurring theme in Street’s work, and the artist has created over 60 artworks of the region over the past 10 years. This unique and fragile landscape has a sense of awe, loneliness and isolation, and this latest series of rugged alpine artworks depicts the diversity of the terrain with energy and vitality. 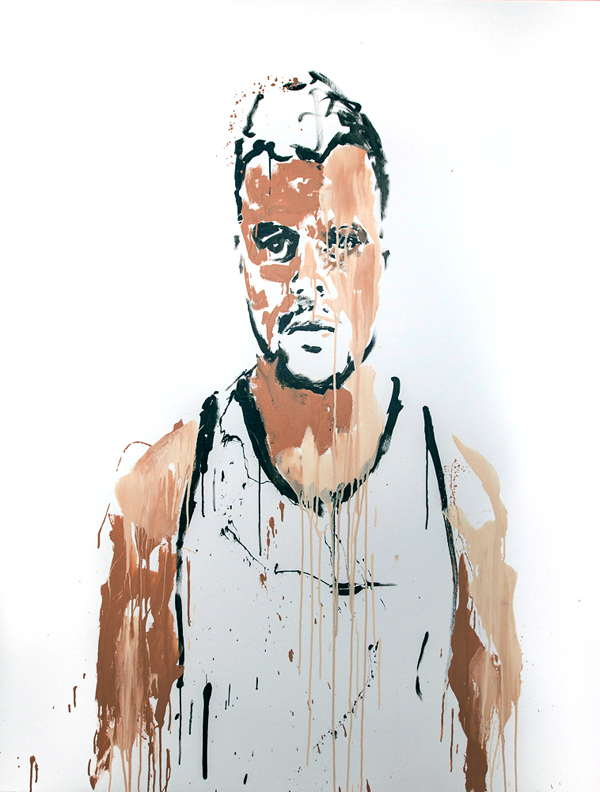 The artist is twice winner of the Mosman Youth Art Prize, has been awarded a full scholarship to Julian Ashton Art School, and has attained a degree in Visual Arts at Newcastle University, with Honours at The College of Fine Arts. 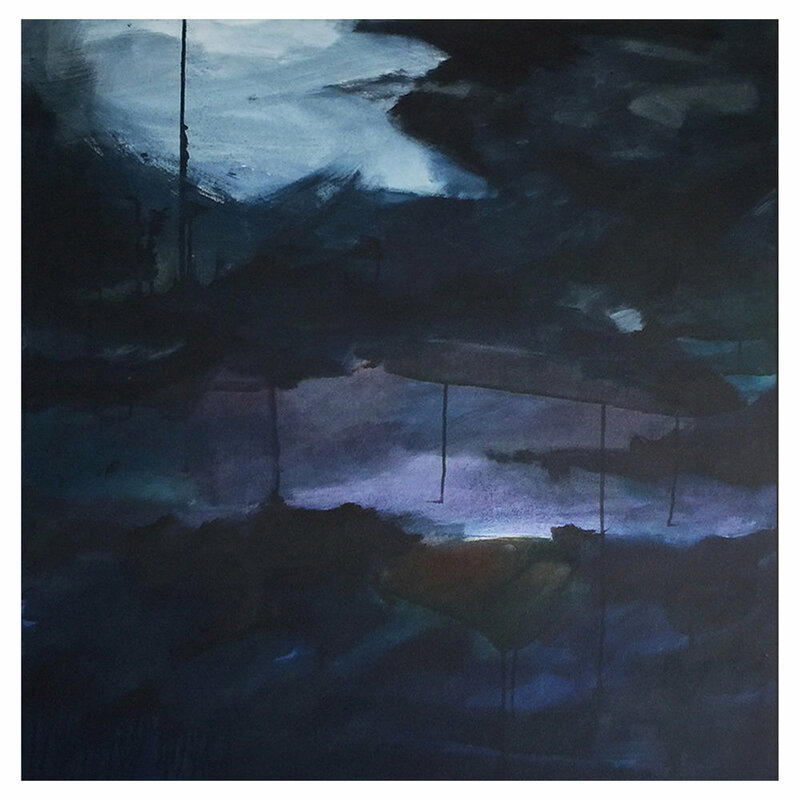 She has been a finalist in many notable art prizes including the Adelaide Perry Drawing Prize, The Muswellbrook Art Prize, The Gosford Art Prize, The Calleen Art Prize and the Fleurieu Food & Wine Art Prize. 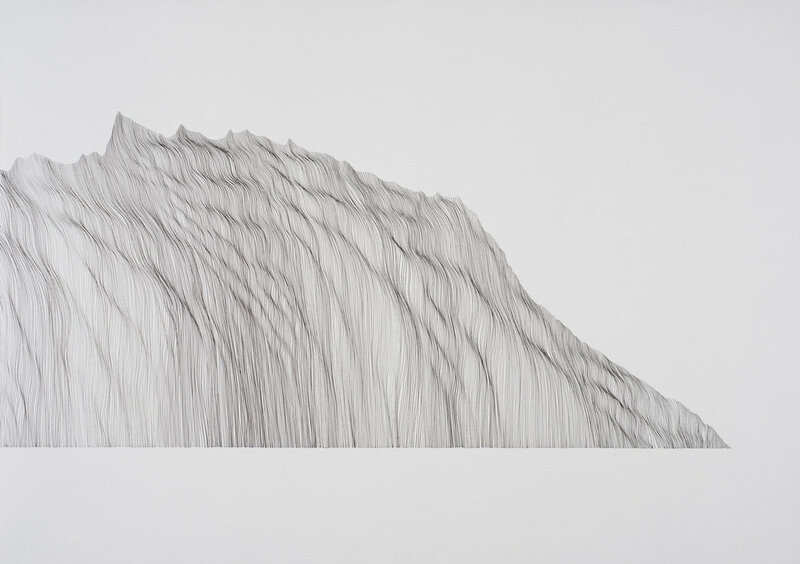 Rebuilding after a personal trauma, Artist and Psychologist Helen Fraser recorded the process of recovery through a series of repetitive line drawings. A fleeting yet profound moment during this process connected her with the image of an internal mountainscape that stretched for eternity. As a result, this body of work appears to reflect the movement from psychological fragmentation to internal strength that comes from processing pain and engaging in prolonged thought about one’s inner world. A Pueblo Indian elder once posed a question to Carl Jung; “Do you not think all life comes from the mountain?” (Memories, Dreams, Reflections pp. 251) Over centuries mountains have been seen as a place where Heaven and Earth meet, providing them with spiritual significance and imbuing them with power and forces of potential. From peak experiences described by mountaineers to famous poets and writers, mountains can represent revelation and transition, the thin air of headiness and sublimity or death, mortality and fragility. This contemplative and meditative work explores the relationship between landscape, memory and our inner world. It gives some insight into the power of the human spirit to heal and recover from trauma or change. To be strong and solid like a mountain requires being vulnerable and humble and to have the courage to face the suffering of being human. If all life comes from the mountain as Jung suggested, this includes suffering, pain, joy, loss, birth, growth, decline and death. Therefore, to meditate on the mountain as my Self, is to meditate on what it means to be human. For Objects for an Unknown Future Museum Sally Simpson uses collected organic and inorganic ocean debris she has gathered over many years found washed up on south coast New South Wales beaches, the beaches of Kangaroo Island in South Australia, and other objects found on her property on the outskirts of Canberra. 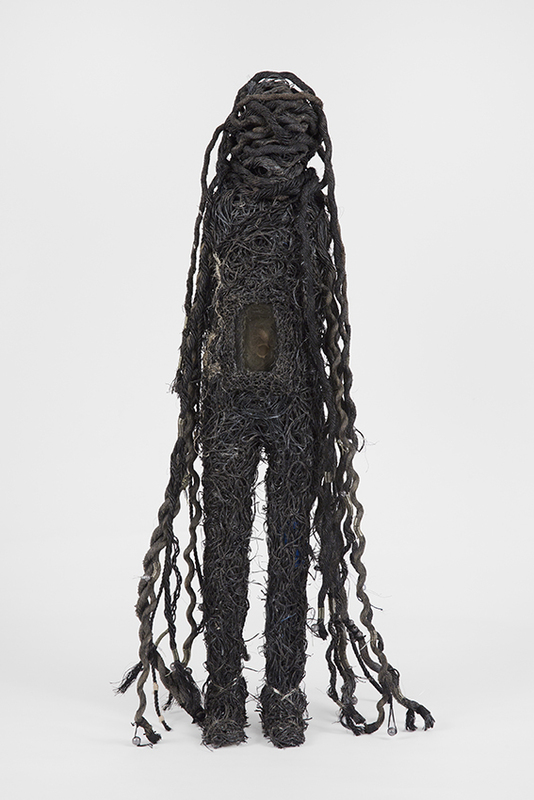 Pieces of coral, shells and dried out fish bones, sometimes bird bones, are embedded in resin and contained in figures wrapped in whipping twine and found pieces of washed up rope and mounted on a base of stainless steel. Her intention is to represent the present for an unknown future museum. She creates objects which belong to a continuous cross cultural tradition of humans attempting to influence and manage the forces that affect the world around them. The over-arching theme of Simpson’s work is the consideration of human relations with the land, the values we assign to it and the way it changes over time. 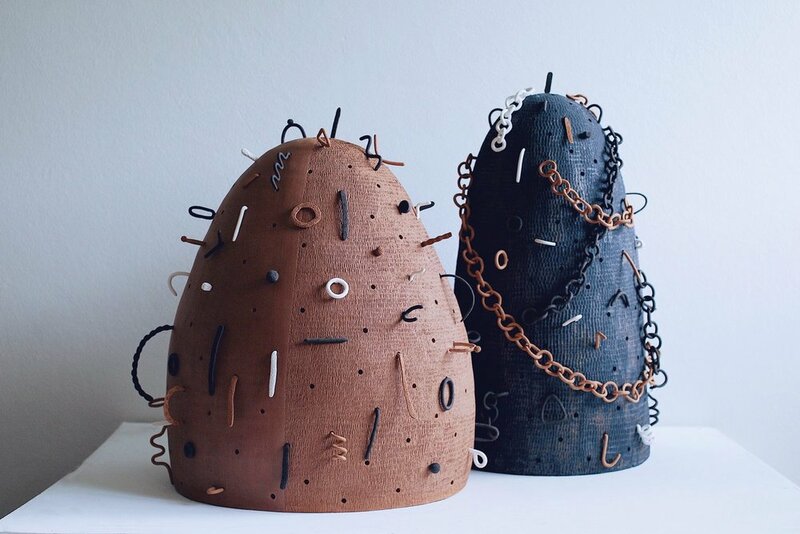 In this exhibition she uses materials collected from marine debris which she then stitches and details to create ritual artefacts for a ‘future museum’. Ritual and time are combined to transform and empower our detritus. These not so small sculptures (most are more than 75cm tall) reference African power figures, voodoo forms and Christian reliquaries. 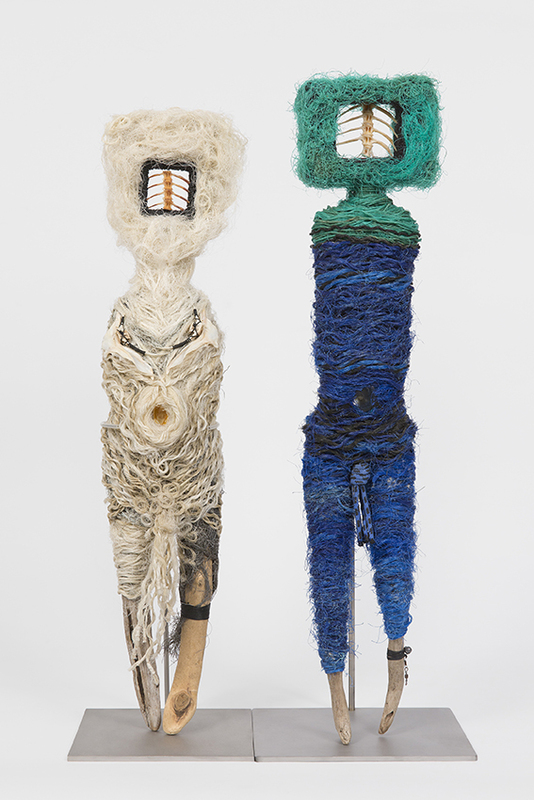 The ritual associations are furthered in Simpson’ s labour-intensive processes of collecting, sorting, cleaning, preserving, transforming, moulding, stitching, weaving and wrapping to create these oddly beautiful and exquisitely detailed figures, spending many hours to create just one of these sculptures. Simpson’s work reflects her fascination with the way values and meaning, assigned to land and the environment, change over time according to point of view, culture and situation. Mairi Ward paints intuitively, as a response to the environment she live in, from the perspective that she is inseparable from it. Ward’s paintings are abstract works composed of intricate layers of overlapping and interlocking forms and colours. For her, the process is the outcome, an immersion that creates a sense of inner peace and freedom. Ward’s paintings are quiet moments of personal freedom and reflections on impermanence. They are about being present and in the moment. Ward’s ceramic objects are handmade, they are slip cast Cool Ice porcelain with decals, they have glazed interiors and hand polished exteriors. 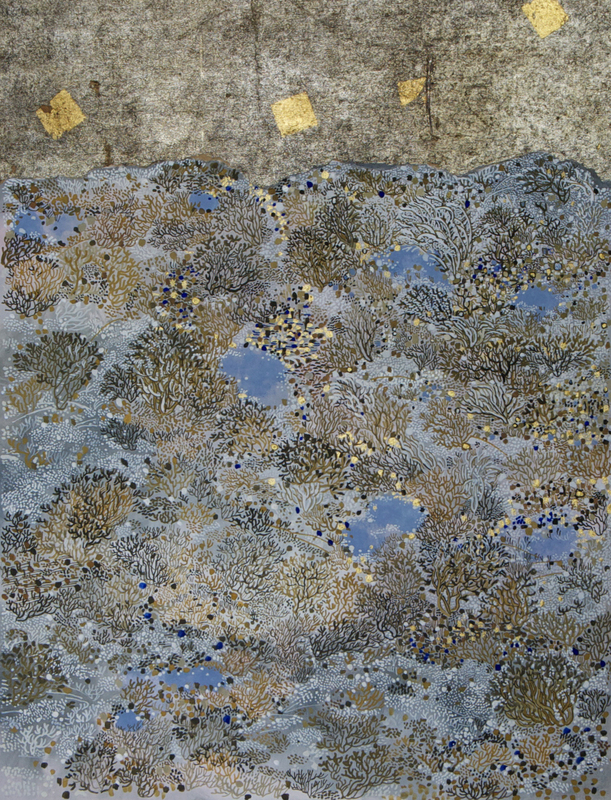 Ward creates the surface designs using imagery from her paintings. Each piece is shaped and sanded before and after firing and the surface designs are selected and applied to each piece individually. Each piece is unique, made to be used and enjoyed. Caspar Fairhall’s art practice covers painting, painted constructions, video and interactive video art. Best known for hard-edged but painterly works with rich surfaces, much of Fairhall’s work can be seen as asking questions of the viewer such as: What does it mean to represent space in an image? 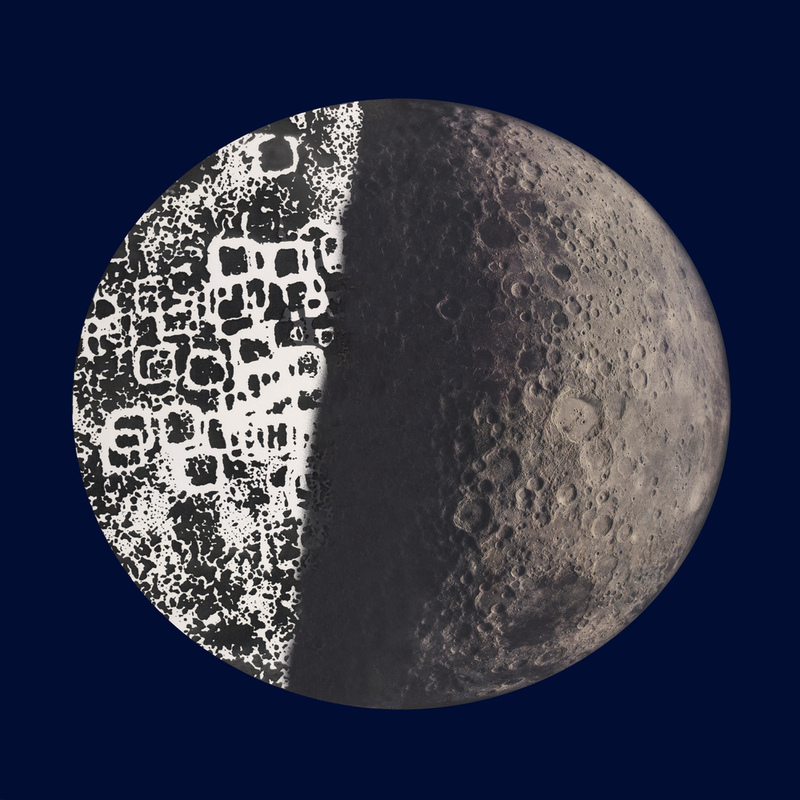 How does the space in an image relate to the space and time outside the image? What does it mean to both look into and at an image? The complex, layered paint surfaces and unresolvable pictorial spaces—what curator Margaret Moore described as propositions for perception—are tools that Fairhall uses to address these questions. Much of Fairhall’s recent work is derived from his time in the Pilbara region of Western Australia and draws on the ancient banded iron formations of the Hamersly Ranges, which date from the Archean epoch 2.5 billion years ago. Both the sense of deep time and the biological origin of these formations are central concerns of this body of work. 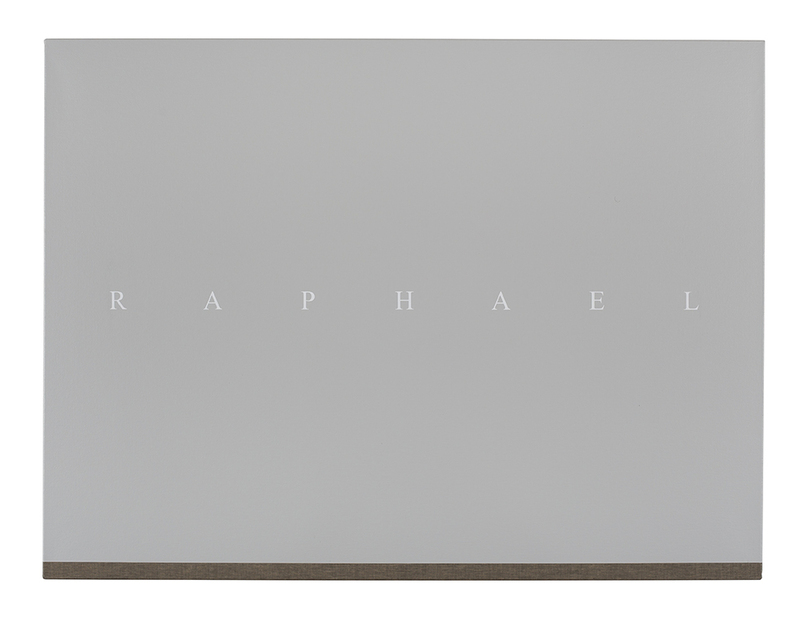 Fairhall is represented in the collections of the National Gallery of Australia, Artbank, the Art Gallery of Western Australia and The University of Western Australia, amongst others. 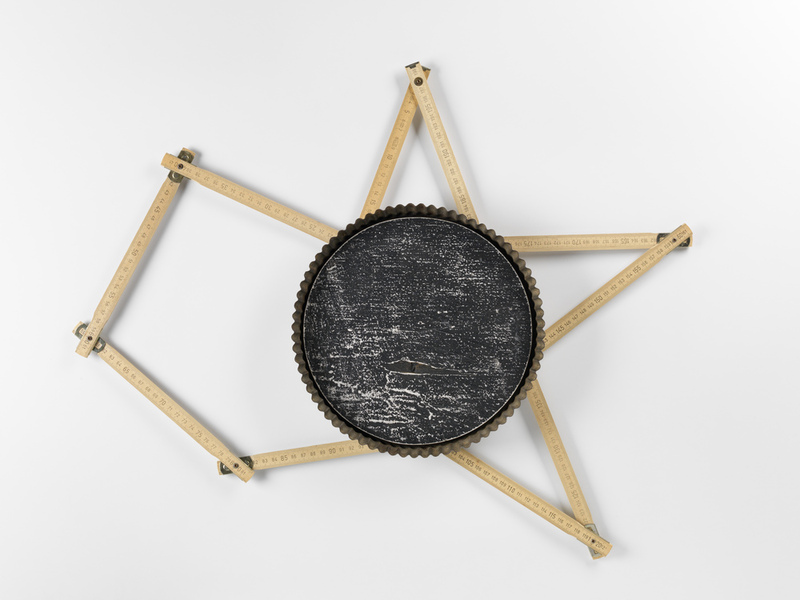 Gera Woltjer works across a variety of media, mainly installation, photography, video, drawing, printmaking and textiles. She makes very considered and deliberate choices in deciding which medium would best communicate the concept and meaning she wants to display. 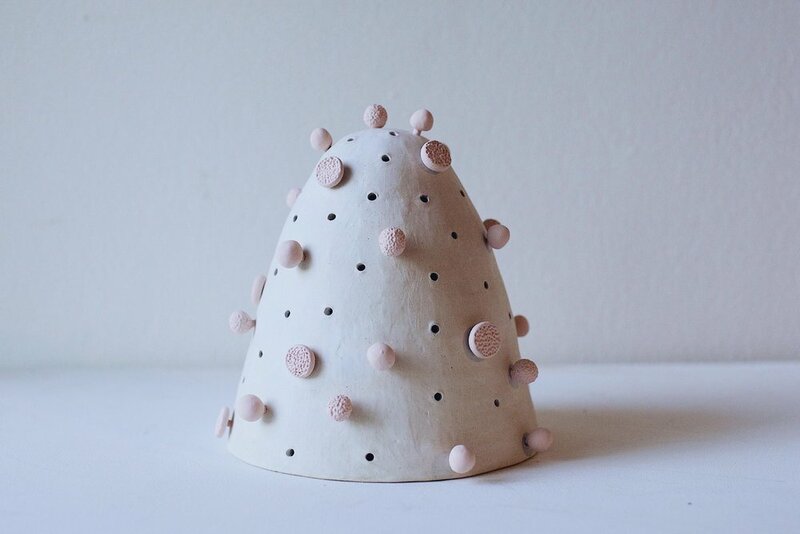 Her process-based artistic practice could be described as being on the edge of art and design and focuses on exploring the materiality of her concept and the chosen medium, aiming to observe and articulate aspects of the human condition, identity, and the complexity of patterns that occur naturally in the world around us. Her works are acutely symbolic, and demand both intellectual and emotional engagement from her viewers. Woltjer's past artistic influences permeated her current body of work. She is stimulated creatively by the concept of communal swimming pools, focusing on short course meter pools. Her most recent body of work is informed by her interest in the geometric aesthetics of communal pools, the use of form and line within the limits of structure, and the concept of fluidity. She recreates and captures the fluidity and nature of the water in a swimming pool, an environment she visits weekly to do swim workouts. Woltjer relishes the rules, the tiled grids, the lane markings, the turning tee, and the movements of the swimmers, which change the visuals of the grids and lines. She has pushed this theme conceptually and materially with new printed, photographic and video works. This exhibition in a conceptual context transports the audience into a pool. Nature’s Beautiful Connections aims to exemplify how fauna is a survivor; how she has parallel survival instincts just like the human brain, especially when impacted upon. Tania Mason aims to reveal gentle ways of viewing matter we cannot see and to create imagery that explains riddles within nature via a conduit of gouache paintings, works on paper and intricate sculptures. The inspiration behind this work Mason’s son, who has a mild neurological condition that she has been studying over the years. This exhibition is concerned with the chaos and the beauty of his mind. Mason explores concepts of neurological patterns within the human brain, the pathway formations within the human mind and natures complex geometric shapes such as vines, plants, trees and leaves. Lee Salomone is an Adelaide based artist who graduated from the South Australian School of Art in 1991. He works across a range of media – including installation, photography, sculpture and works on paper. His art practice addresses both the contemporary world around him and his cultural heritage, with Italian peasant traditions having provided a life-long source of inspiration for his practice. Bronze Age is autobiographical, with many of the ideas & themes precipitating from the artist's life including his passion for gardening, Italian peasant rituals & traditions. The ways in which nature and culture affect and influence one another are a constant in Salomone’s practice. Over the past six years there has been a shift in Salomone's sculptural practice, brought about by his commencing part-time work at a bronze foundry. Bronze Age is an accumulation of observations and experiences that have been shaped into bronze artefacts. 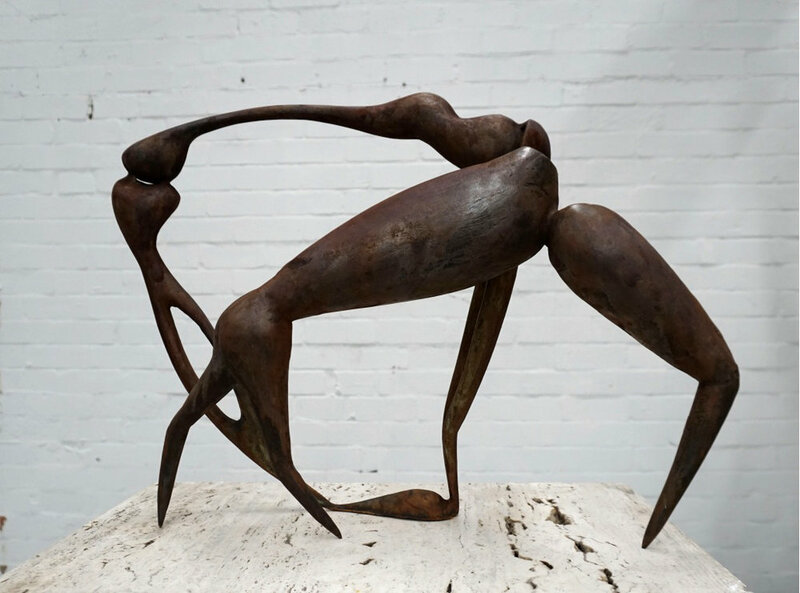 This will be the artist's first fully bronze solo exhibition within Australia, and the inclusions of process-based skills associated with foundry work compliments the artists twenty-five year practice, broadening his artistic investigations into form and beauty. From a young age Shannon has shown a fascination with Renaissance Art, in particular the techniques used to capture and manipulate light such as scumbling and sfumato. 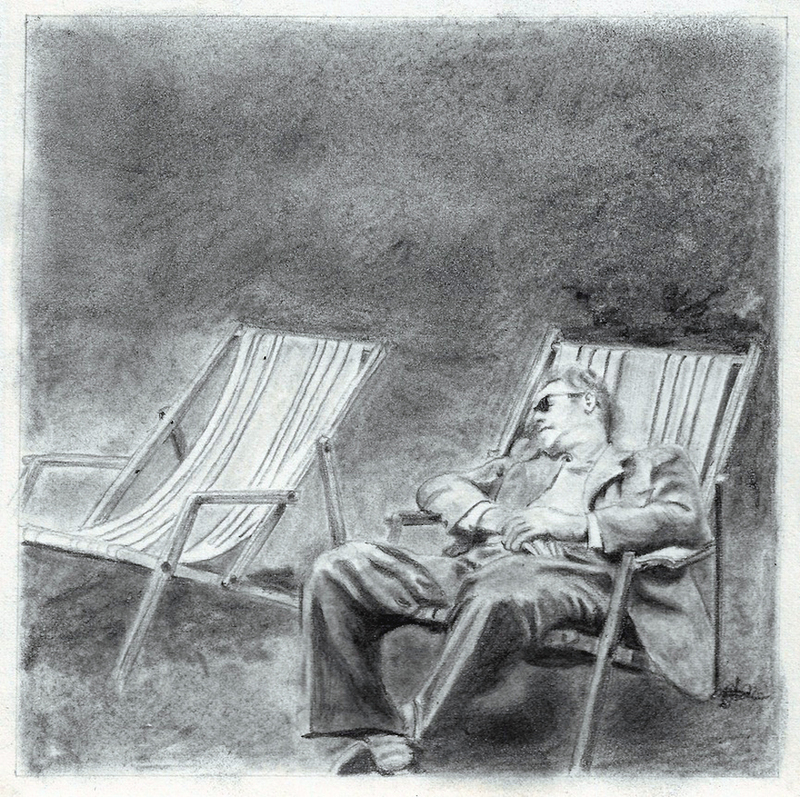 As a teen he was introduced to these techniques and soon appropriated them to create a personalised style characterised by the use of chiaroscuro. This Renaissance term meaning the use of strong contrast between light and dark has become the foundation of Shannon's work. Equal to his fascination with Renaissance art is his fascination with street art and the plight of the street artist. 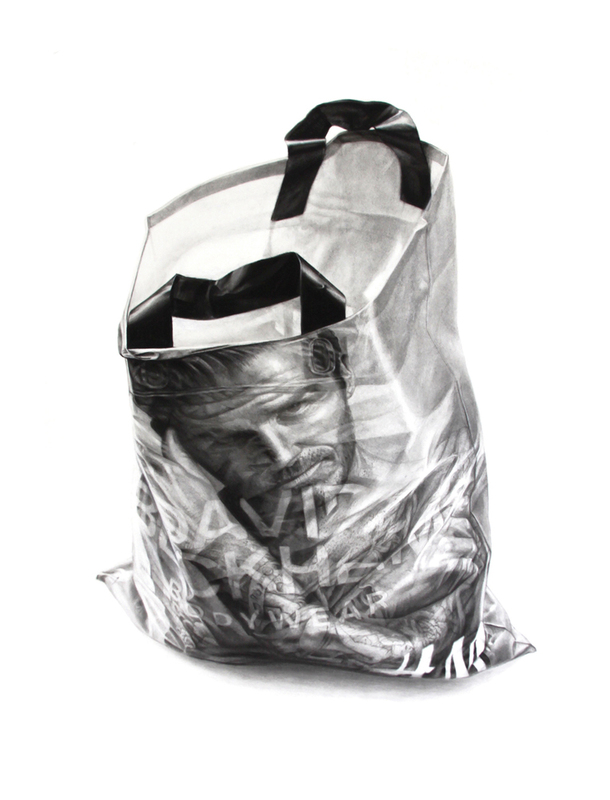 Shannon will often use the street artist character in his work to represent an allegory for his own life as an artist. While the street artist is his muse, Shannon's preoccupation is creating atmospheric light that enhances tonal contrast, connecting the subject to the space they have been captured in. His latest work is an attempt to merge his interests; combining painting techniques from Renaissance art with the subject of street art. Anthony Day is driven by his love of the natural world. 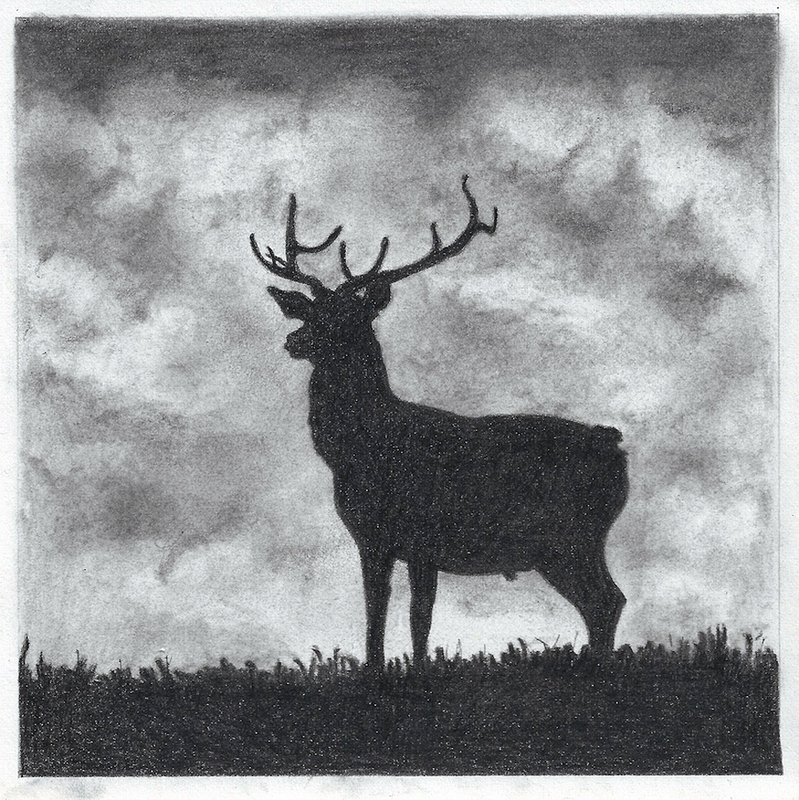 He focuses on the mood and form of the environment, drawing inspiration from it's transient nature. Day’s artistic process thrusts the landscape into unique combinations of painting, sculpture and installation. His works manifest themselves on surfaces; paintings in natural frames, as well as works combing oil paint, acrylic polymer and resins to create objects. Day's unique vision is instilled in all his creations. A love for the Australian terrain is an indelible part of Day's contemporary practice. His understanding of natural colours present in Australia’s wide skies and burnished ground permeates his work. Day focuses on the power of the Australian landscape, adapting his palette with the changing moods and shifts in weather. From her country studio near Daylesford in central Victoria, Sandipa expresses her engagement with nature's inner workings. The paintings in Gathering: the ever present are the artist's response to the harmony and inter-relationships that exist within the time honoured balance of the natural world and what forms a basis for its survival. Our human element in this is often overlooked or disregarded as we live and move around in man made environments. Though an understanding that we are part of a living whole is central to existence, the struggle to integrate into nature is often elusive. Sandipa's perspective summons us to tread lightly on earth and actually live in balance with the natural eco-systems that surround us. In the Greco-Roman Mythology, the punishment of the king of Corinth Sisyphus in Hades was to roll a heavy stone uphill that constantly rolled back down, requiring continual effort. The term Sisyphean is hence suggestive of the endless labour which is life itself. In 1942, French philosopher Albert Camus wrote the existential-phenomenological book: “Le Myth de Sisyphe”, in which he addresses his belief in the absurdity of life and human’s endless search for meaning in a meaningless world. 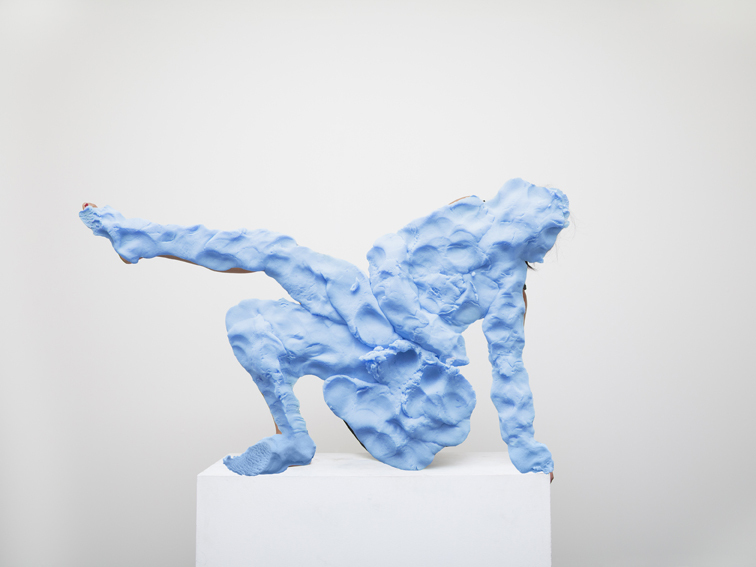 The sculptures engage with existential issues, taking inspiration from the term Sisyphean and the ideology of Albert Camus. The works ask what it means to be alive, what it means to be a human being… the sculptures project solemn darkness and gentleness, strength and vulnerability simultaneously. The figures are suggestive of Sisyphus; mysterious and ambiguous like life itself. There is a lyrical metaphysical feelings to the forms; they convey a strong physical presence, an “otherness”. The sculptures, like the myth, like Camus Philosophy, do not give a clear answer – Does Life give a clear Answer? “My work is an abstract view of an imaginary world — a world informed by the trappings of a closed space. It is a space between walls and frequented by people. What remains inside this space is invisible, but over time, it becomes contaminated by human presence, which fills the room with palpable energies. At first glance, my drawings strike up a graphic immediacy and playfulness, with frequent shifts between chaos and calm. Intrigued by the unknown and the unseen, his subject matter and its meaning is left deliberately elusive and complex behind the abstract forms.” - Joe Scerri. Scerri’s forms are drawn as a filigree of discordant linear marks, stretching and retracting: a magnificent madness of dancing debris that morph and manoeuvre, captured through an animated stillness. The lines are applied in different widths, lengths, weights and forces, revealing the various depths of the currents integral to the ongoing body of work. In more recent drawings, large scale works possess a greater thrust of movement and power, in contrast to the softer, finer, almost ornamental pencil drawings on paper. Interspersed with floating ‘reflectors’ that pierce the composition as windows to other worlds, they display a dynamic shift into new territory for Scerri, who attempts to capture the moment that a thought emerges and then evaporates. They may read as elegant or wasted, valiant or vile, walking the fine line between two forces set in play that often question one another. Scerri investigates mind-mapping through various media — painting, collage, sound, sculpture — but it is with drawing that Scerri has realised his greatest potential to explore. "Since Mitchell McAuley moved to Italy he has begun an exploratory journey into the aesthetics of architecture and time. Art is his agency of enquiry, in which he fuses the past — which contains many states of what were once the present — into his own contemporary moment. This is the seduction of history, and for an Australian artist looking backwards over European historical time McAuley’s art practice has taken an exciting detour into Europe’s formidable landscapes, traditions and art. With the architecture of Italy, Spain and Portugal, from fifteenth century basilicas, Roman catacombs, Moorish citadels or modern masterpieces, McAuley has developed what might be called an entry and exit methodology, a narrative about Time as a quantum concept of materiality, ideas and transience." 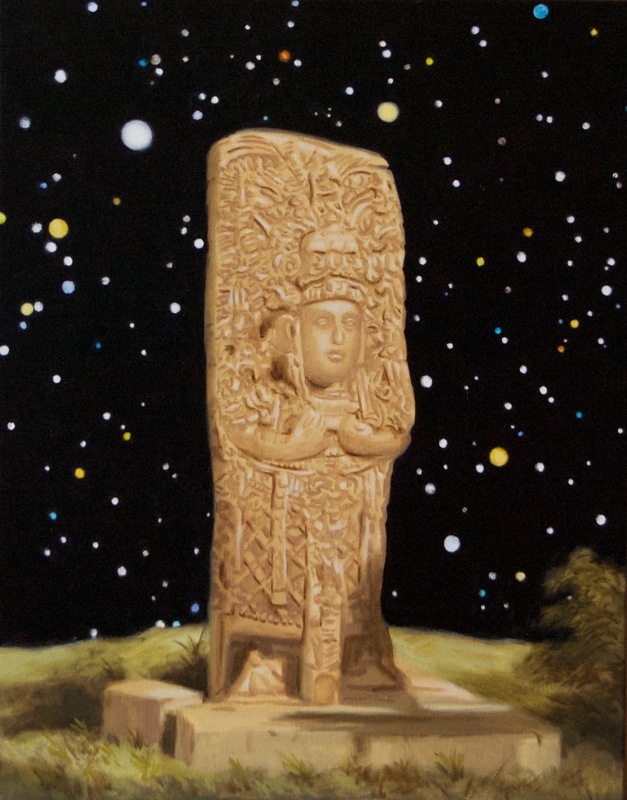 Richard Knafelc investigates the place of human beings in the cosmos, and possible intersections between astronomy, archaeology and the landscape. The concept underpinning his work, is in essence, the finite versus the infinite. This is informed by philosophical ideas of cosmological and transcendental infinity and notions of the sublime. A link to Ashley Crawford's wonderful essay on Richard's work can be found here. The history of colonial settlement in Australia is littered with tales of “discovery” and exploration. This narrative of heroic endeavour didn’t die out in the modern era, but rather scaled down and bled into the way Australia was marketed to tourists. As tourism increased in the postwar period, souvenir media such as postcards and brochures contained tales of great feats of entrepreneurship by those who promoted certain kinds of destinations. Proprietors boasted of building attractions or catching and training wildlife with their bare hands. In promoting their attraction-building prowess, these men overwrote existing landscapes and traditions with their own legends. Inspired by vintage postcards, Wonders of the Past suggests a continuation of these narratives. Old-school tourist attractions such as Big Things have started to assimilate into the landscape and taken on an agency of their own. Victor Meertens is a visual and performance artist whose work is informed by the space between analogue and digital sound. 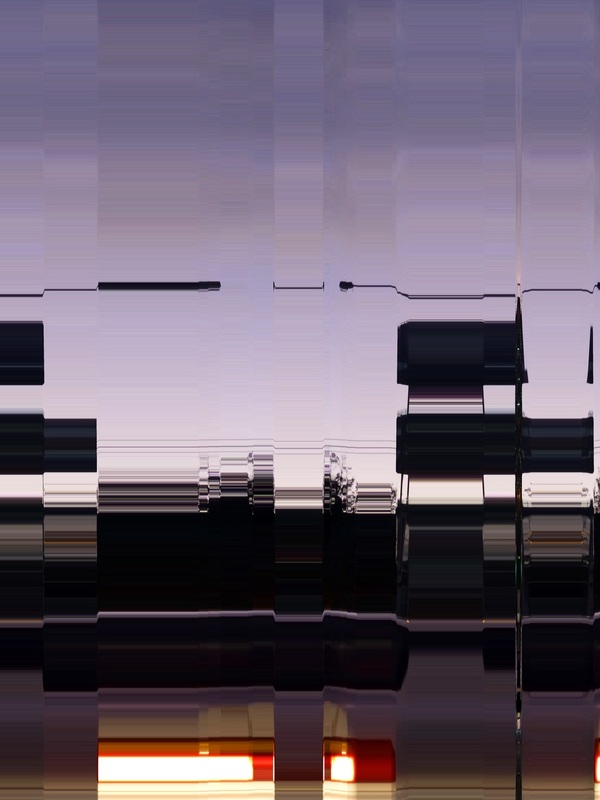 Meertens finds beauty in the glitches that occur in the translation between the two and gives graphic form to a largely aural language. Some say Art has its own particular Energy. Some say Art need only be pointed in the right direction by the artist. Some say there, Art might find its true Sounding Board. 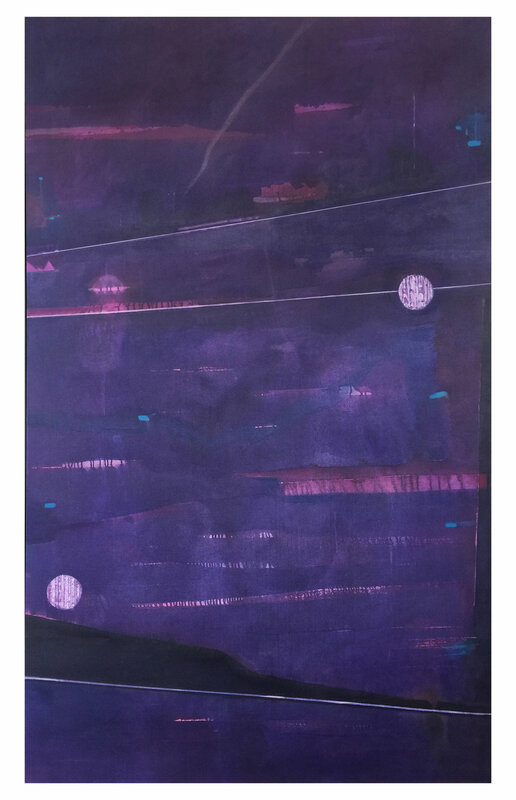 Eloise Kirk’s practice explores the unification of collage, painting and sculpture, sampling images of rock formations, icebergs and clouds that are bordered by large sections of flat acrylic colour. 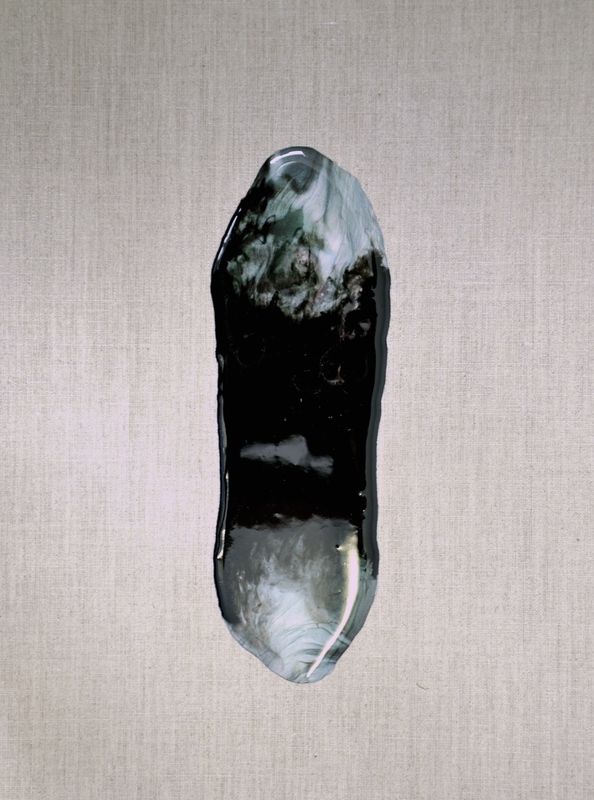 The works are often partially concealed by linen and reflective pools of resin, which refer to the mystic act of “scrying” or peeping into the future. 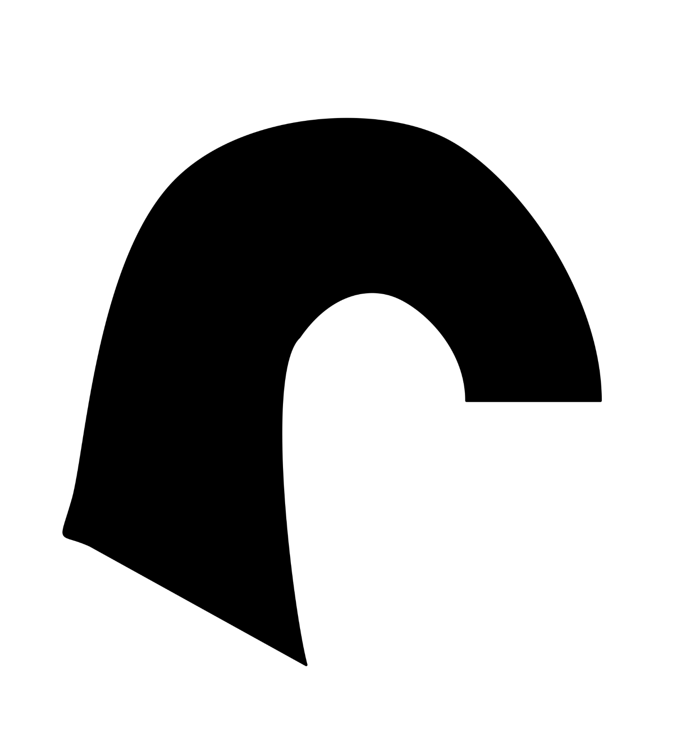 These negative spaces offer a void for decent into the unfamiliar. The works are exercises into the aesthetics of the elusive, testing the boundaries between the romantic and the surreal. 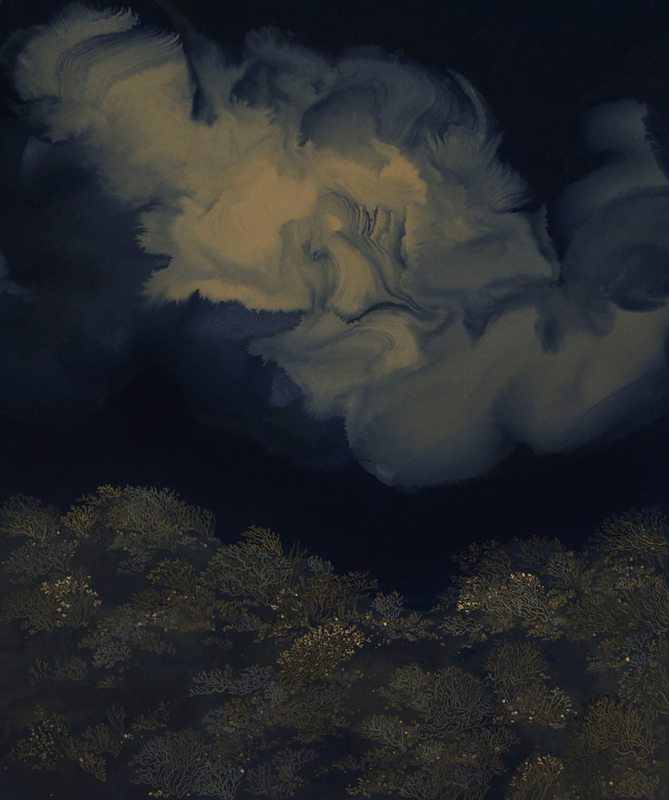 Kirk draws upon the subject of landscape and geological form, forging connections between discarded images, fetishising and fictionalising landscapes, proliferating a tangled narrative and the colonisation of images and objects. Conceptually the works offer an aesthetic response to the juncture between beauty, desire, and disaster. 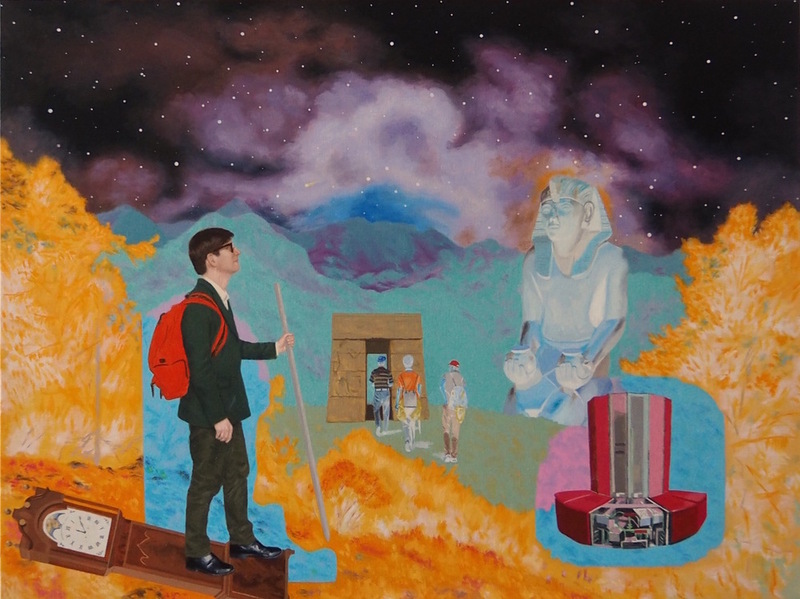 They explore the human connection to the fantasy of ruin and the surreal formations of these desires. 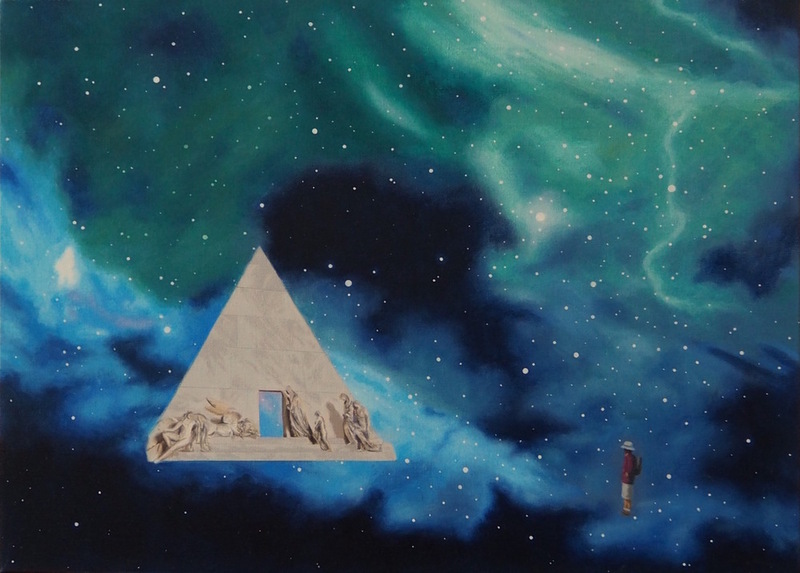 Kirk's fragmented and mysterious images are both connected to and displaced from their original context, sensitive to the idea that thought will embrace a geographical space in such a way that, regardless of whether it is real or fictional, this space becomes a product of human thought. 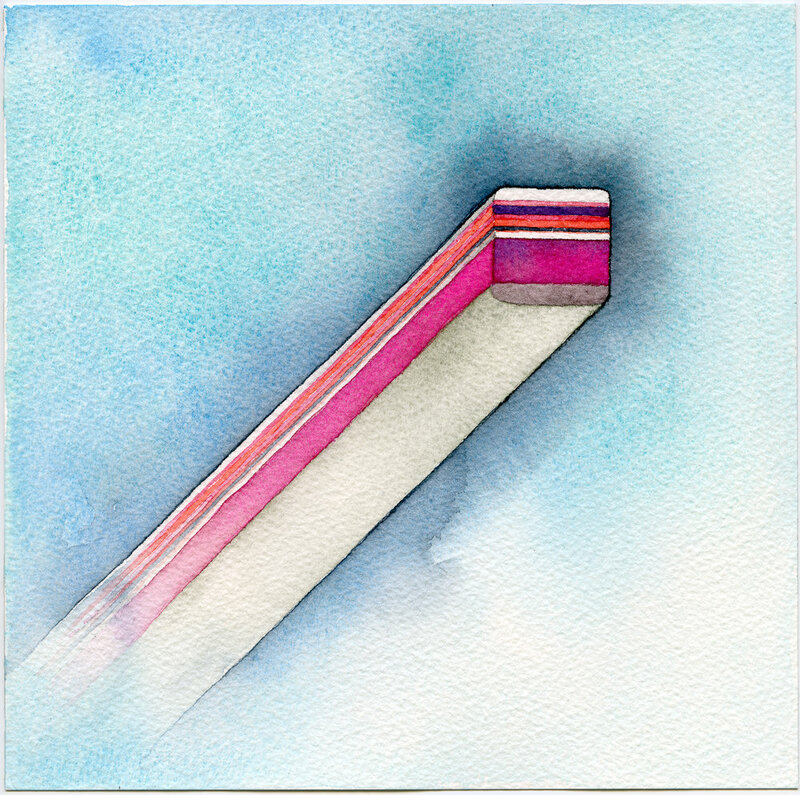 Working in a range of media, Sequeira explores ideas about culture, language and information through colour and geometry. His current body of work, After ’65, refers to the Museum of Modern Art, New York 1965 exhibition The Responsive Eye, which was the first international survey of art that incorporated optical illusion. Collaborating with miniaturists in India, Sequeira depicts himself in historic Indian attire against a black and white patterned background. These works can be understood as visual reconciliations of two pictorial traditions that link the date (1966) and place (New Delhi, India) of Sequeira’s birth with innovations in western modernism. While the After ’65 series offers a visual self-reflection, the series 50 Songs can be understood as giving form to aspects of human experience. 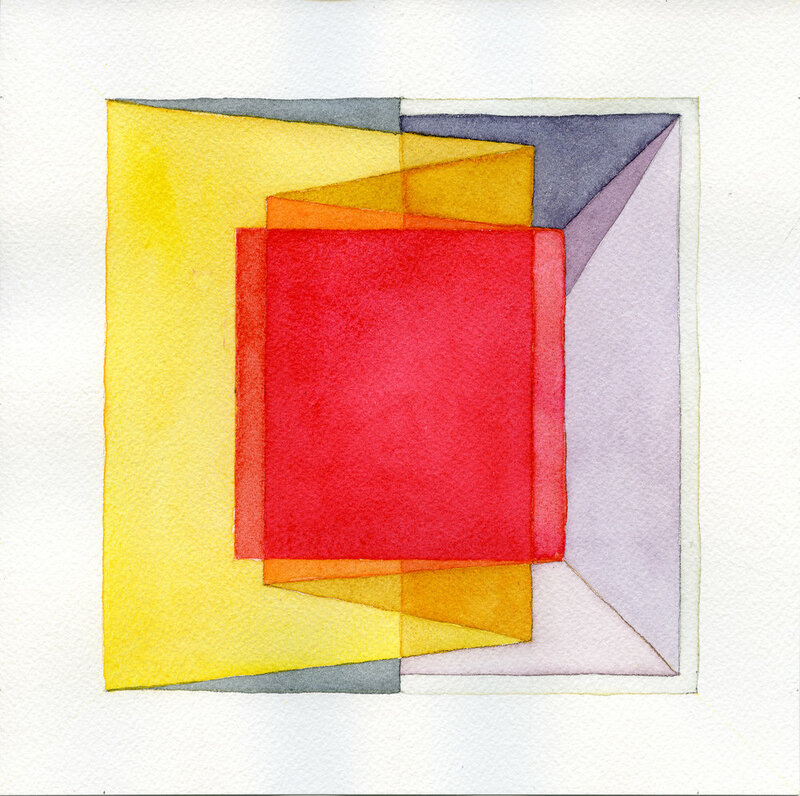 In this series, geometry and colour are combined to create diagrammatic meditations. These 50 works celebrate elements from 50 years of the artist’s life. David Sequeira thanks the miniaturists from Uday Arts, India for the portraits and the birds that they so lovingly contributed to this exhibition. Gresswell works in an improvisational manner, interested in finding poetry between the real and the imagined. Her paintings are a form of self-discovery, an inner dialogue about what is seen, felt, evoked or imagined. They represent impressions left on the heart and mind. Creating and disturbing, Gresswell allows the work to evolve intuitively. Textured works on paper and wood transpire through contrasting loose, transparent layers of paint with areas of dense application. Gresswell often prefers to use materials from the hardware store such as sandpaper, timber and house paints. Sometimes the surface is perforated with a needle or drill, opening up the space and at other times, small, found off-cuts from the studio are utilised in her work. The paintings are sanded, stained, splashed upon, drilled and scratched into, all suggesting that she prefers evidence of the artists’ hand. 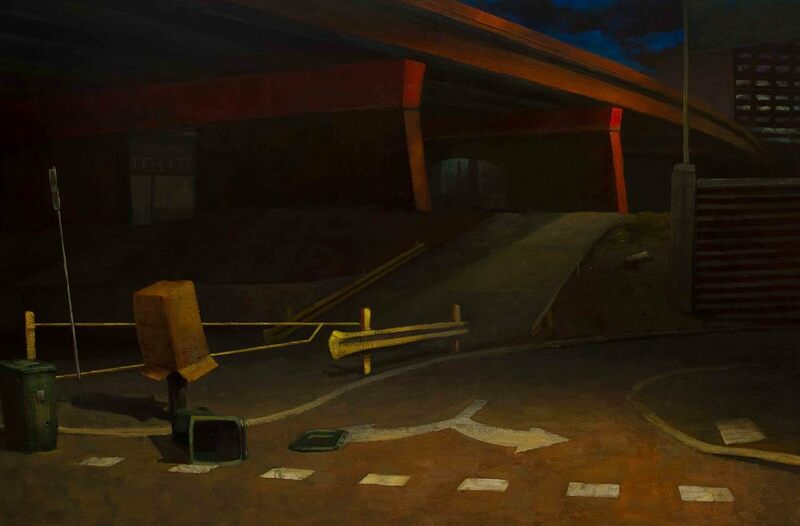 Gresswell has an honors degree from Chelsea College, London and is currently a MA Fine Art student at RMIT. 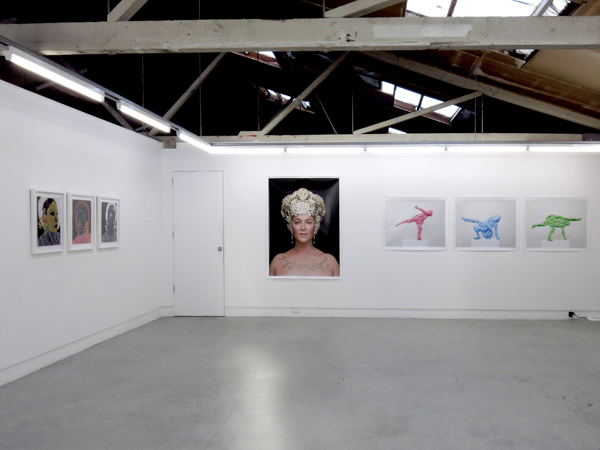 She has exhibited in solo and group shows in London, Paris and Australia. This exhibition foresees the potential for expression beyond the limit of the canvas; furthering the artworks connection to the surrounding by exploring different visual configurations as the viewer moves around the space. This show explores the momentum in the act of painting to capture the physicality of brush movements, in pursuit of an abstract continuity amongst material boundaries and the spatial void in-between. Vibrant colours in a centralised wave of activity combine material and technique from calligraphy and street art to challenge conventional perspective and visual aesthetic. Nanou is a Belgian artist based in Melbourne whose work techniques and subject matter are inspired by international art residencies and her personal experience of migration. The field of her creative practice is influenced by her artistic studies in Fine Arts and an Interior design degree in Belgium. In addition to Nihonga and Chinese painting tutorials Nanou has completed an MA in Public Art at RMIT University Melbourne. 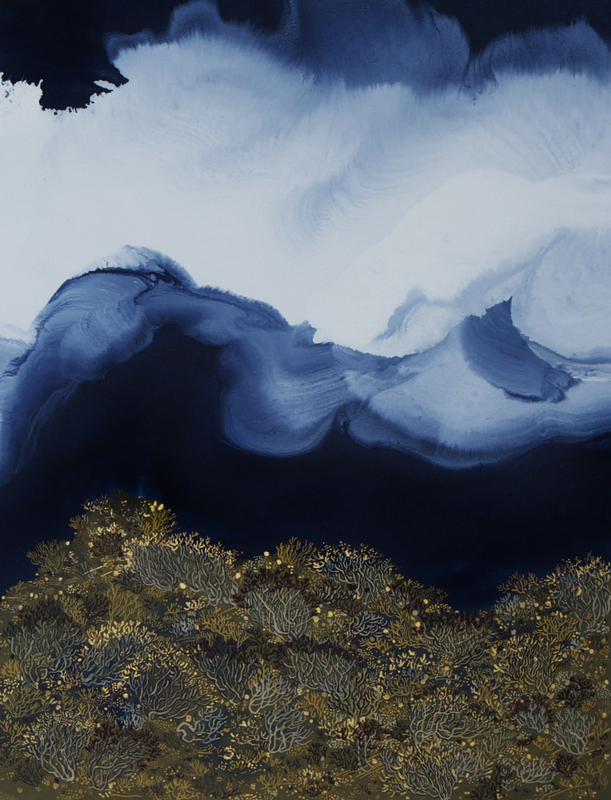 Her work merges element from the natural environment and the urban landscape using natural mineral pigment and industrial medium to suggest depth and movement in the work. Alun Rhys Jones is an Australian-based artist, whose practice focuses on themes related to identity, commodity, media, and popular culture. 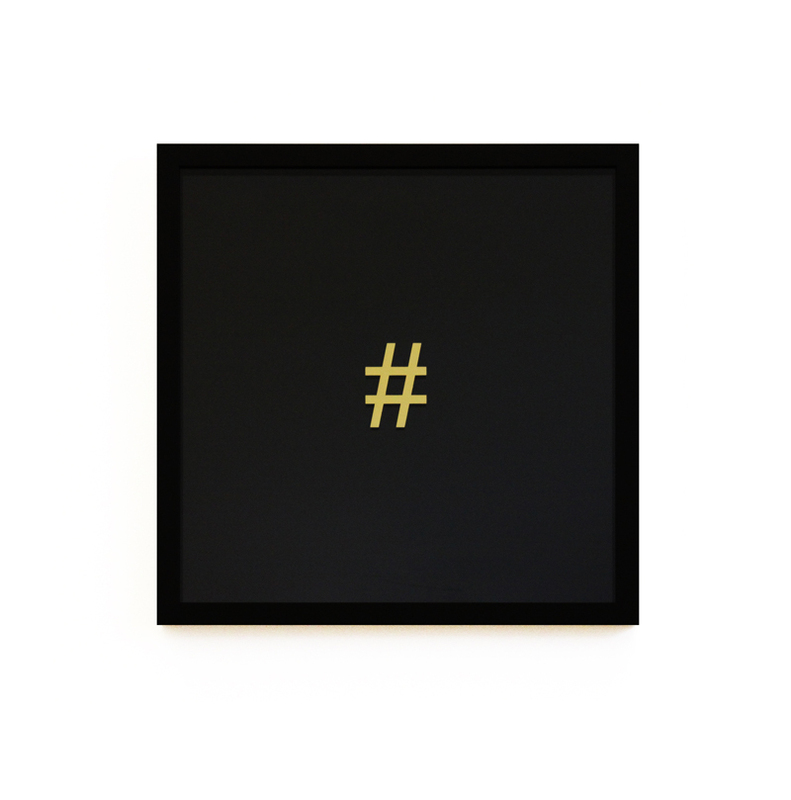 Recent work has investigated the use of the body, gender, celebrity, form, language and colour in a post internet, late capitalist, consumer society. His work questions the relationship we have with visual media, allowing us to analyse the processes by which we see and are seen and to question our sense of reality within a mass media world. Celebrity surrounds us, from film to sports, from Facebook to fashion, from TV to Twitter, permeating our lives with a glamorous, dazzling allure of chance and possibility. But beyond this glittering surface, celebrity reveals key insights into how we see ourselves; our psychological desires, social needs and economic wants. Who we admire, model ourselves upon and aspire to be, reveal what we think about ourselves on a deep and profound level. Celebrities are reverred with a Godlike status possessing a cultural authority to act as spokespeople, commentators, role models, brand ambassadors and political advocates. They serve for many as the arbiters of taste, morality and public opinion. Celebrity illuminates massive shifts in contemporary culture, and plays a key role in shaping todays world through consumerism, the media and politics. The upcoming exhibition #Celebrity at Gallersmith Project Space explores the tropes of celebrity in contemporary society today. The stairs as seen from the ceiling. ‘The stairs as seen from the ceiling’ is a new solo exhibition by Andrew Varano which explores the politics of empathy. 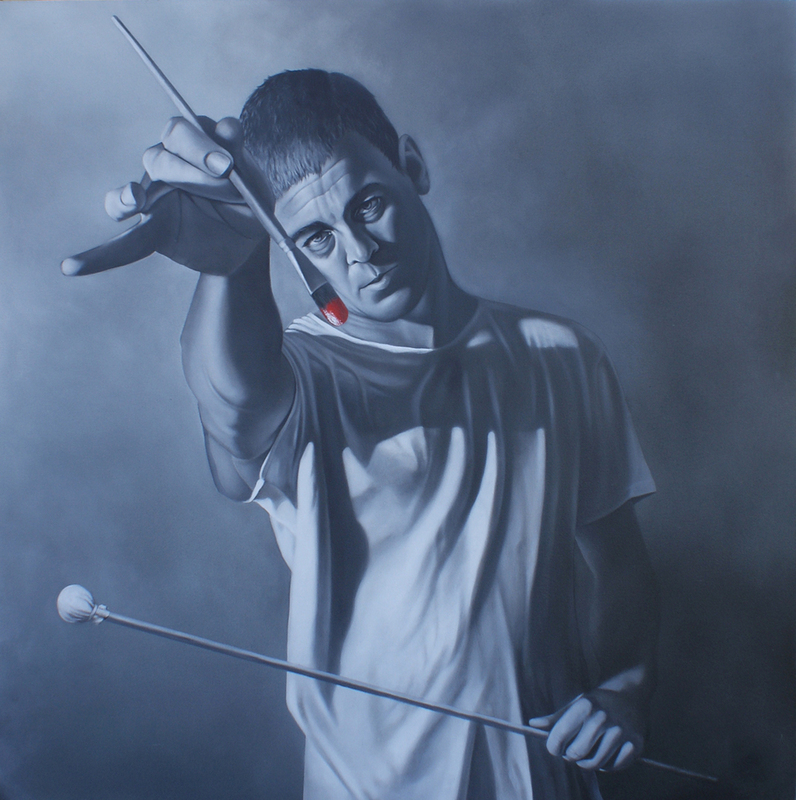 Andrew Varano is an artist from Perth who graduated from Curtin University in 2010 and has held solo exhibitions previously at the Fremantle Arts Centre (2010) and Venn Gallery (2013). In 2009 he attended the Fondazione Antonio Ratti program in Italy and in 2010, was awarded the Dr. Harold Schenberg Prize. 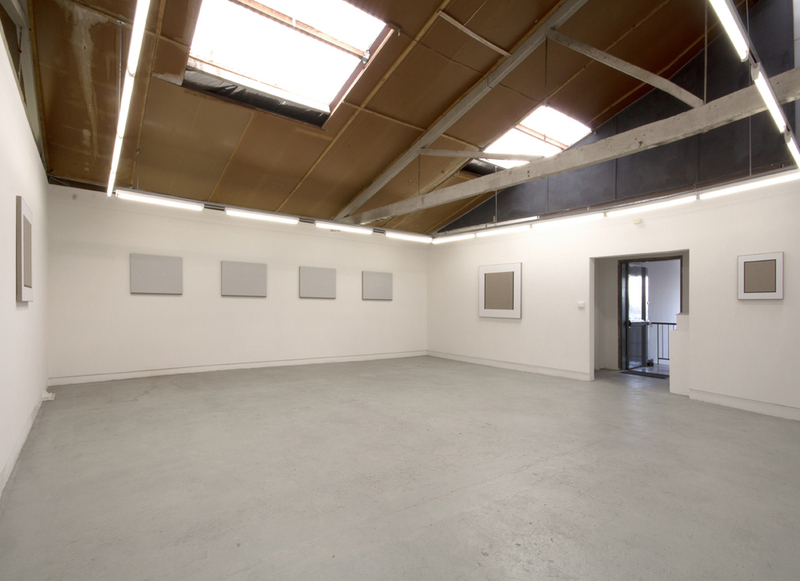 Between 2011 and 2013 he co-directed OK Gallery in Perth which exhibited new work by emerging Western Australian artists alongside their interstate and international peers. This year, Varano undertook the Australia Council curatorial development program as part of the Venice Biennale. He is the founder of the new podcast ‘Status Effect’ which presents long form articles, essays and fiction concerning the social and political structures of the art world. Later this year or early next year, along with Dan Bourke and Gemma Weston, he will open ‘Pet Projects’ an ARI based in Perth which will present exhibitions for smaller, focused audiences. Varano has had writing published by Artlink, AQNB and Un Magazine and currently works as an art installer. Elizabeth Nelson’s work explores the exotic and theatrical world of Melbourne’s Botanic Gardens. She finds this environment to be a place of magical beauty, strangeness and sensuality. Plants, water, and rocks come together in a grand visual and operatic drama. These large-sized works make for a striking performance. We can view each element in these works as like an individual actor on a stage playing its part. Nelson’s work engages with the Romantic tradition of celebrating the grandeur and mystery of nature. The works for Nelson’s exhibition, Verdant, were made on location at the Gardens, over many months and across the seasons. Each work begins as a single sheet of paper and is then expanded to include multiple sheets. This organic process reflects a sense of physical immersion, documenting the artist's experience over time. In a world where cultural exchange occurs through the screen, Model Citizen aims to look at how digital surveillance is increasingly prying into our personal lives. Governments across the globe are collecting personal information of its citizens at an unprecedented rate. Surveillance of this kind acts as a system of control that can be used against individuals who seemingly don’t act in accordance with the powers that be. The exhibition Model Citizen questions the role these states of power have when gathering and using personal information and what kind of invasions we are willing to allow them in the pursuit of freedom. 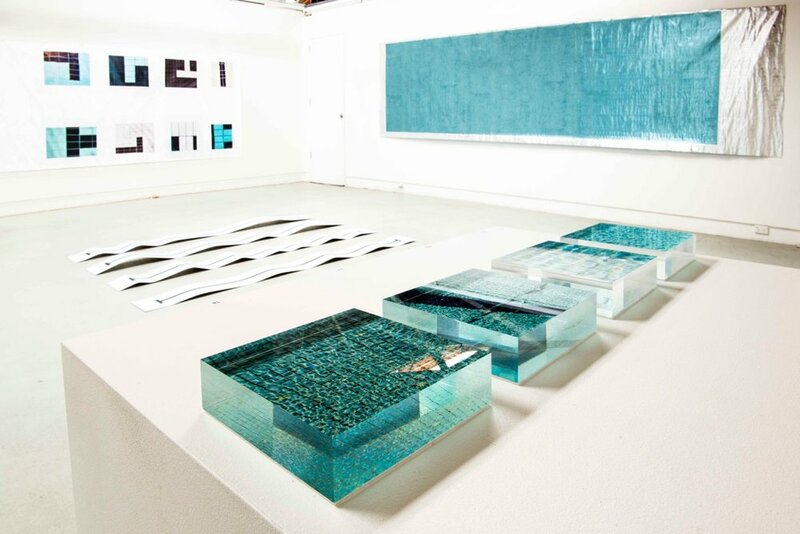 Lucas Davidson is a multi-disciplinary artist whose practice combines digital and material processes. 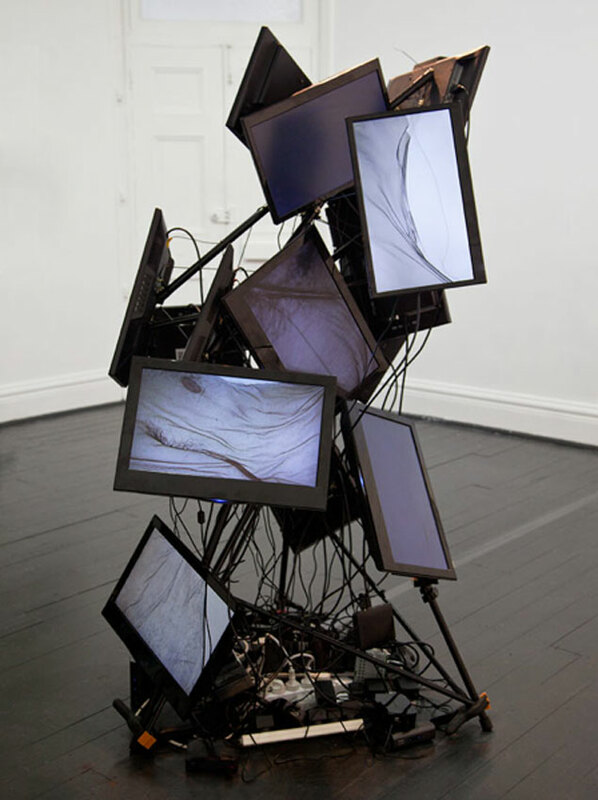 Taking form as objects, images and installations, his current works examine our relationship with screen-based technologies, focusing on the convergence of digital experience and physical embodiment. 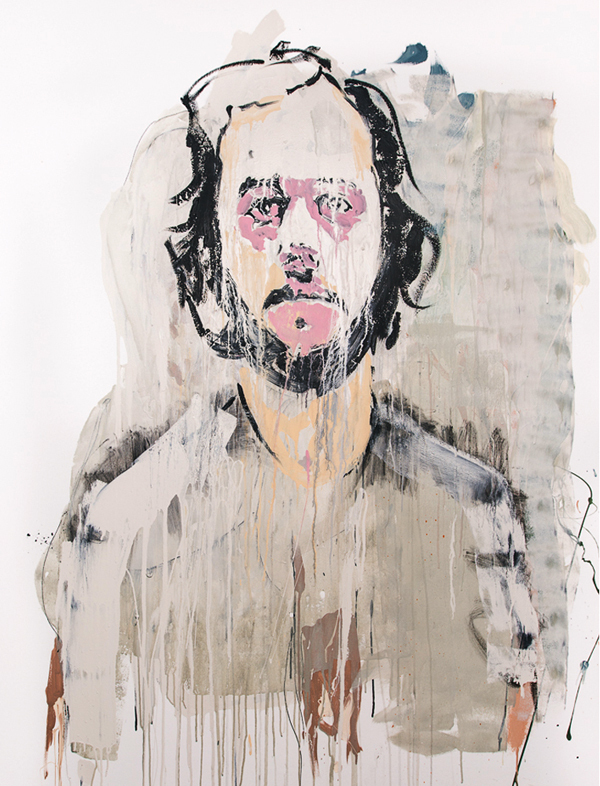 Lucas Davidson holds a Master of Fine Art (2012) from Sydney College of the Arts. 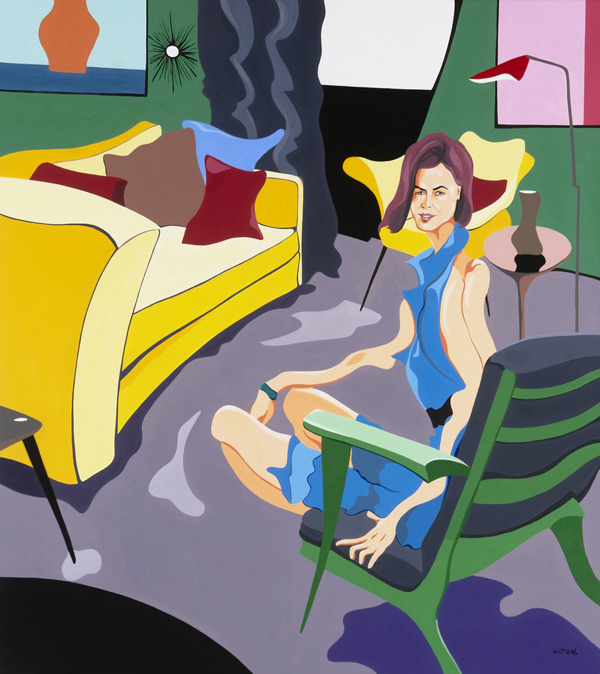 Davidson’s work has been exhibited in Australia, the United States and Germany. Recent solo exhibitions include: Untitled (Flat Screens), Dominik Mersch Gallery (2015), Habitual Loop, The Substation (2015), The Weight of Water, Linden New Art (2014), Multiple Drafts Model, MOP Projects (2014), Immaterial, Firstdraft Gallery (2013). 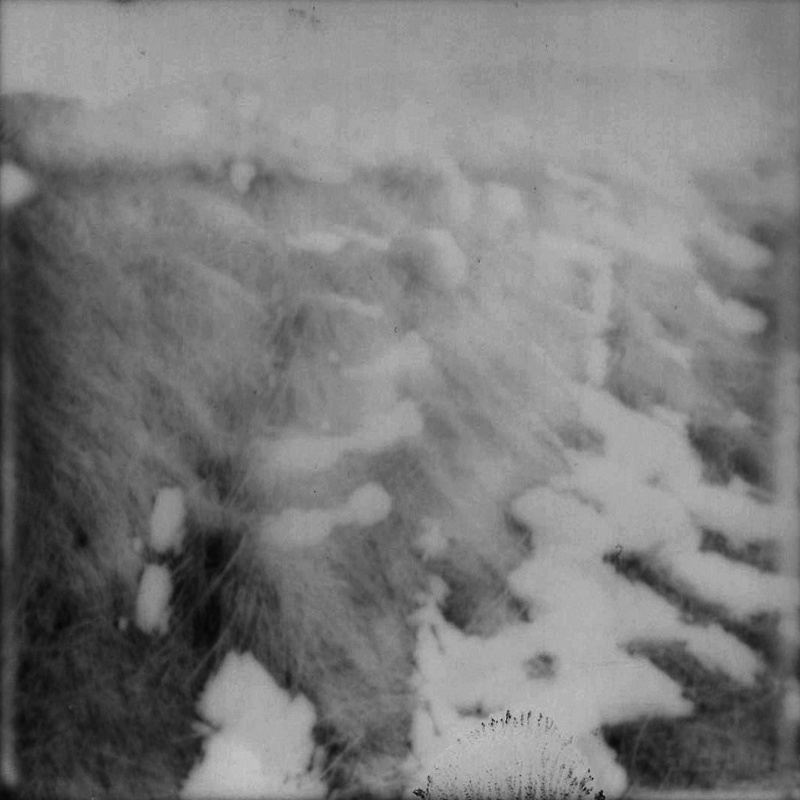 Nicola Moss' practice observes and interprets the ecology of landscapes. Moss’ hand-cut paper works investigate the delicate nature of plants and their resilience to adapt and make homes in our ever-changing cityscapes and the role humans play in shaping environments through influences of culture, conservation and development. During the past seven years, her practice has revolved around her research on the coastal urban landscape of South-East Queensland, along with residencies in the heritage town of Hill End, the World Heritage listed Greater Blue Mountains region and most recently, the regional town of Grafton. Her research develops though numerous site visits and engagement with community groups. These direct experiences provide personal, social and historic stories, connecting history and ecology. 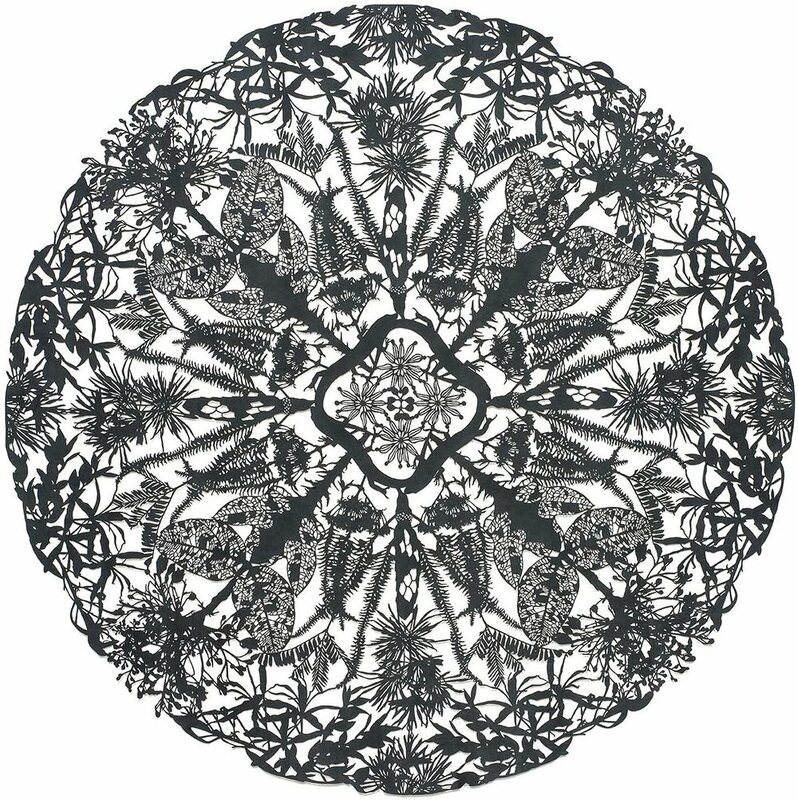 Her intricate paper mandalas are cut from a single sheet of paper, using a surgical scalpel with blades which need to be changed every hour or so. Each work of this scale involves a week of drawing and paper preparation before approximately 80 hours of cutting time before it is completed. City and Nature focusses on contemporary issues of biodiversity, identity and subsequent community values and looks at the spaces in which human development and nature collide. Alicia Mozqueira is a contemporary Australian artist whose current practice is centered on landscape and figure painting. 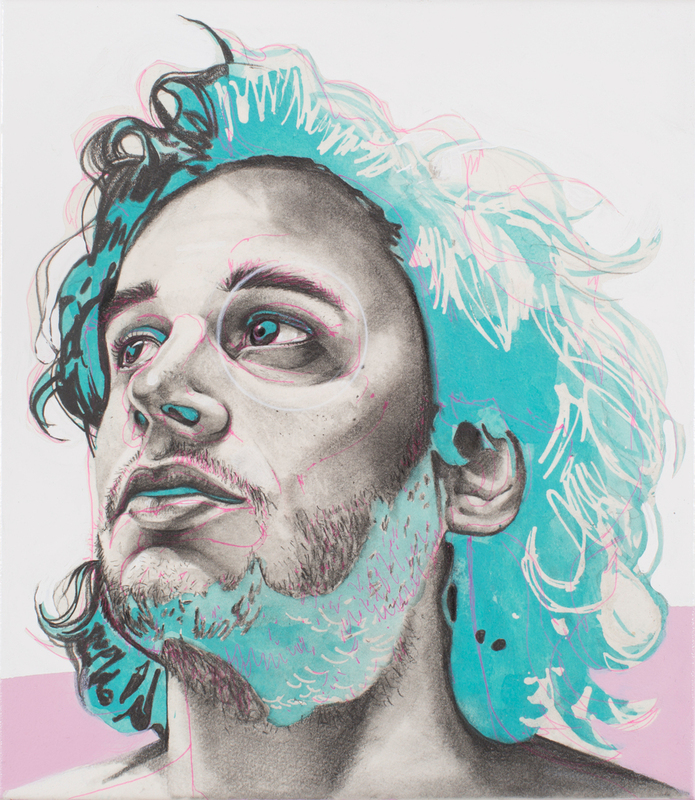 Mozqueira is the youngest finalist in the 2015 Art Gallery of New South Wales Archibald Prize for portraiture and in 2012 Mozqueira became the youngest finalist in the history of the Wynne Prize for landscape painting. Mozqueira graduated a Bachelor of Visual Art from the Australian National University in 2013. As an artist of romantic temperament, Alicia Mozqueira is engaged with the enriching capacity of the beauty of the natural world. She holds the conviction that beauty possesses substance beyond superficiality or material finitude. 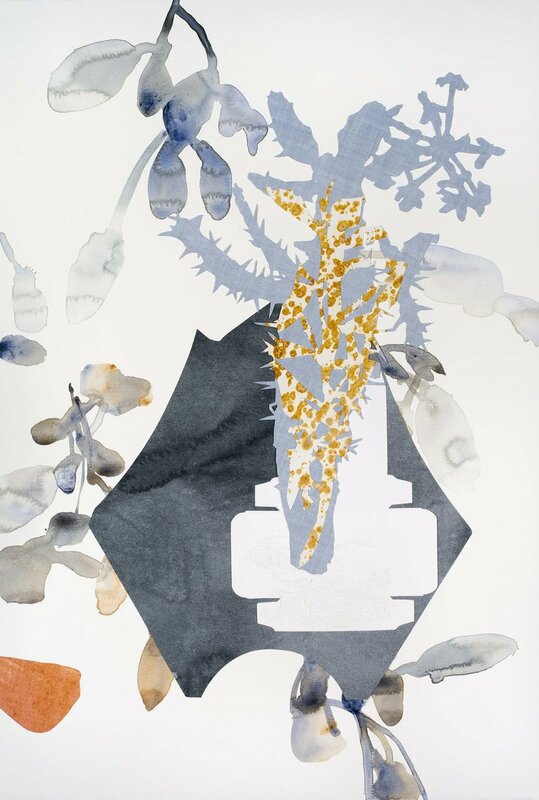 Mozqueira's most recent work, Illuminations II, is a series of paintings inspired by the delicate Australian alpine flora, which flourishes within the severe climate. Through the use of stylized form, miniature detail, multiple perspective and luscious, rare materials, Mozqueira's paintings communicate an essential and intuitive sense of a landscape, as well as the idea that power can be held within delicacy, refinement and beauty. 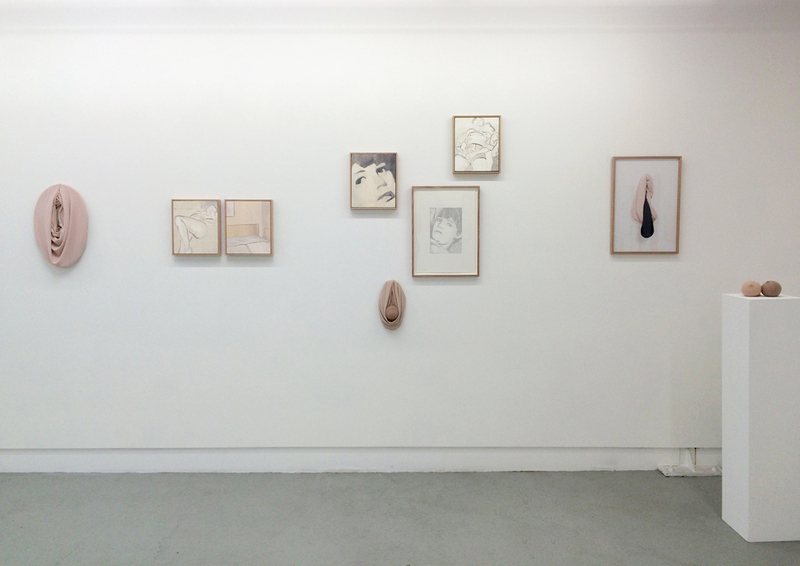 WALL | PAPER brings together six artists working with paper and encompasses drawing, printmaking and sculptural works. A meticulous and methodical approach to art-making is shared by all. Each artist takes inspiration from different aspects of the external world that trigger a personal and emotional response. In translating these onto paper, they evoke themes of landscape, fate, memory and loss. Crypsis is an exhibition of experimental new works by three Western Australian artists, Stephanie Reisch, Jon Tarry and Joshua Cobb-Diamond. Sound, drawing, sculpture and digital media are employed to test and expand on notions of permanence, visibility and ancient forces. Crypsis uses Augmented Reality (AR) technology as a counterpoint for the physical artworks, combining graphics, sound and animation to construct 'Dusk to Dark', an invisible sculpture which performs within the visual arena. 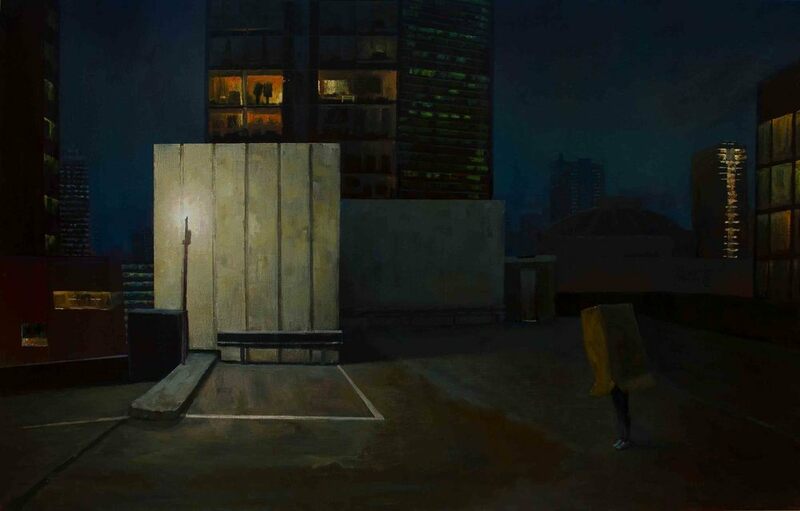 Manifold’s oil paintings depict the lone figure ambling through alleyways in Melbourne landscapes, dwarfed by skyscrapers and highway overpasses. A dark, saturated palette details hard geometrical streetscapes, bathed in the soft liminal glow of dusk and the night-time sky. Adorning the figure’s torso, a flimsy upturned cardboard box, mimics yet contrasts the impenetrable vast, heavy buildings. This recurring motif’s vulnerable transient interior is accentuated by the sturdy veneers of the surrounding concreted architecture and questions the influence of the modern social delineations, boundaries and interfaces we traverse daily. Manifold’s paintings tread the discourse of unnoticed physical and psychological terrains. City landscapes, constructed by people yet cluttered by ‘anti-spaces’, Manifold’s paintings reflect tensions between states of camouflage and discontinuity in an era of increased communication and alienation. These intimate self-portraits open enquiries regarding the place and positioning of the human condition in this contemporary technological age. More than once Nic Plowman wandered toward life’s edge. On these occasions, he moved more briskly than his usual saunter, propelled by forces he could not control. Thankfully, as death came into view, he turned around and danced back—unready, rib tickling, bold, in love with the world. Suffering a congenial heart condition that incited two bouts of open-heart surgery, as well as a near fatal accident five years ago, Plowman’s understanding of the tightrope between life and death is intimate. He can recall moments—from hospital beds, his mother’s house in the country, and the comfort of his closest friends— when everything, quite suddenly, became fragile. However, when fragility muscles up it turns to tenderness. Moving past the place where things fall apart, what was once weak finds a sympathetic and elastic strength to cope, and move forward, despite ill wind. In this way, death was never an earthen endpoint. It was not a religious nirvana either. Instead it was a state that could define, through opposition, the exquisite quality of life and human tenacity in the face of deep loss, pain and struggle. In Plowman’s exhibition No Other Knowledge a series of people from the artist’s life—some well known, others he met quite recently—are elevated for heroically wandering out to the end, before dancing back. As he might call them, lion-hearts. This tenacity connects the sitters in Plowman’s newest portraits. These women and men have experienced addiction, abuse, malady, the loss of loved ones. Each has faced great existential tests. And each, through various faiths (in gods, in people, in pure momentum), has resurrected themselves. As Plowman’s sensitively wrought visions describe, the everyday person rises to sainthood not through perfection or piousness but through a commitment to keep evolving: we are reminded of their battles by the small halo-bubbles that contain mementos from the past; by the way their wrinkles, tattoos and blemishes seem to smile-out their secrets. In this way, flesh circles the halo. Using a corporeal palette—blue of veins, ochre of skin, purple of bruises, crimson of tissue—the artist’s chosen aesthetic is blood-bound. In keeping, the religious quality of Plowman’s work is less concerned with the following of God (one he grew up with, yet abandoned) than with a profound belief in the humanity of his loved ones, be that someone he met in a life drawing class or a long-time kin. Here, humanity finds religion an empty vessel without seeing itself inside, a mere story for which to be anchored: true spirituality, however, emanates, just like the recurrent halo-shroud found in these works, from the imperfect narratives of everyday sainthood. 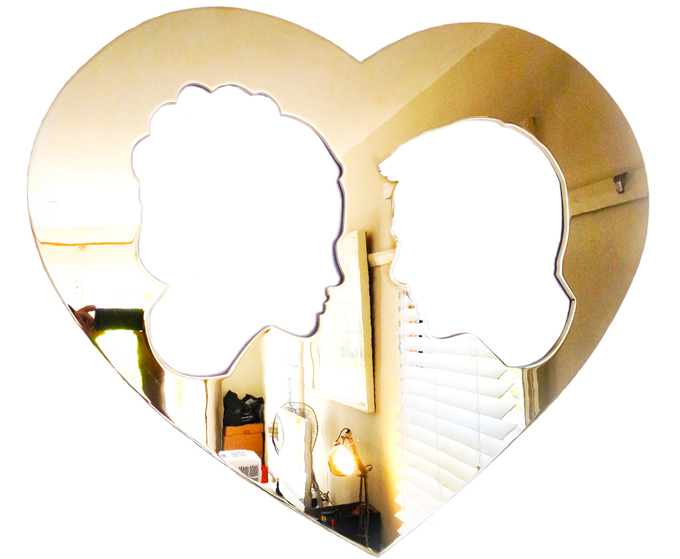 Laura Skerlj is a Melbourne based artist and writer. 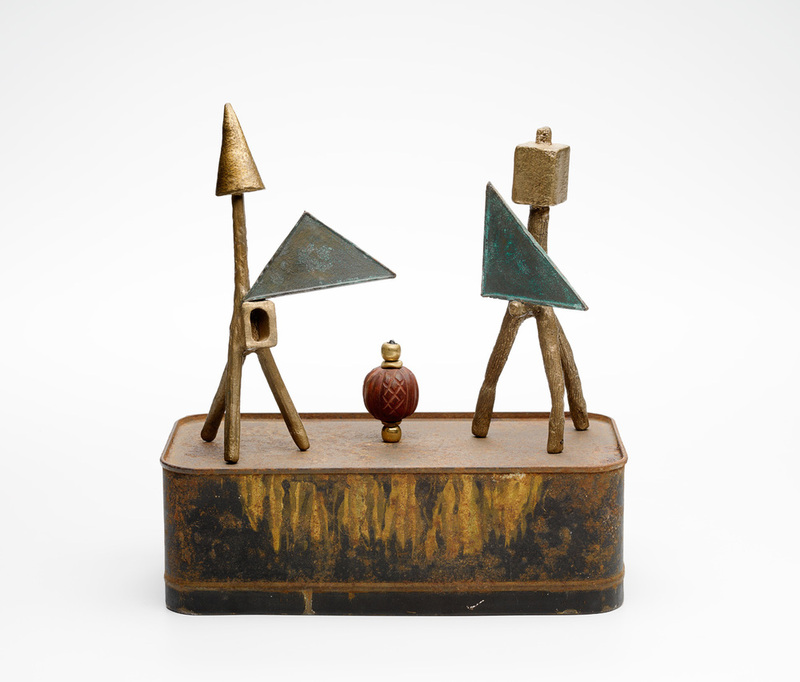 Triangulation refers to a dialogue between Brooke and Buret that concerns not only the geometric forms with which they work, but also the mathematical process of using two fixed points to determine a new, unknown value. Working two hundred kilometers apart, this dialogue often takes the form of intuitive responses to ideas expressed in emails and conversations, as well looking at and responding to works in progress. In the summer of 2014 Brooke and Buret both began making work using the colours and forms of butterflies. 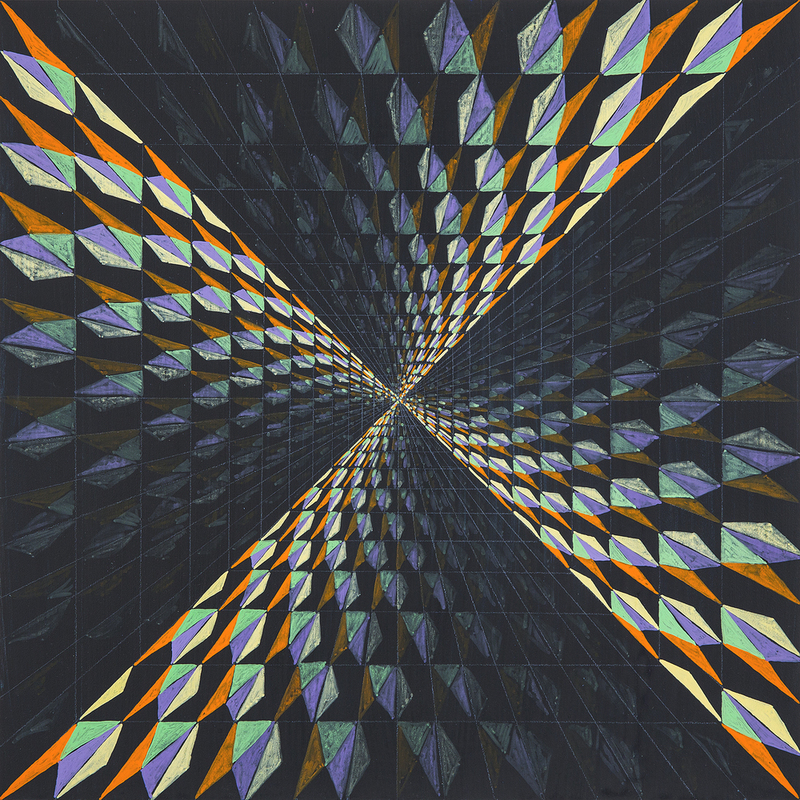 Brooke’s paintings arose from a collaboration with applied mathematicians who analyse complex structures inside butterfly wing scales, while Buret’s work was informed by her observations of Blue Jewel butterflies, Hypochrysops delicia, in her garden. 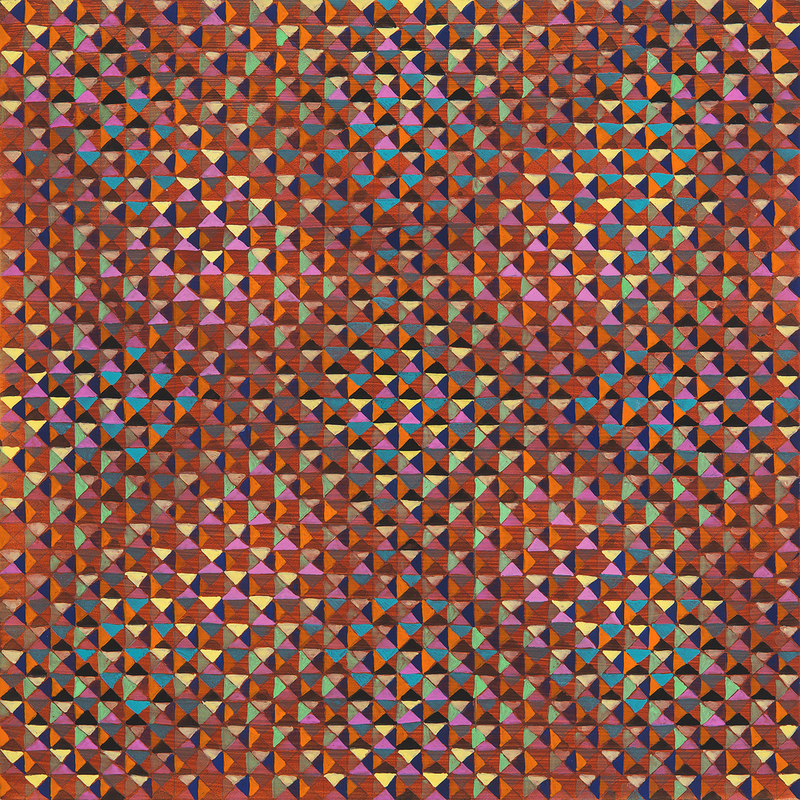 Using the shared visual language of grids and geometric forms, Brooke and Buret explore the possibilities of tapestry, painting and modular constructions to establish the third point of the triangle. 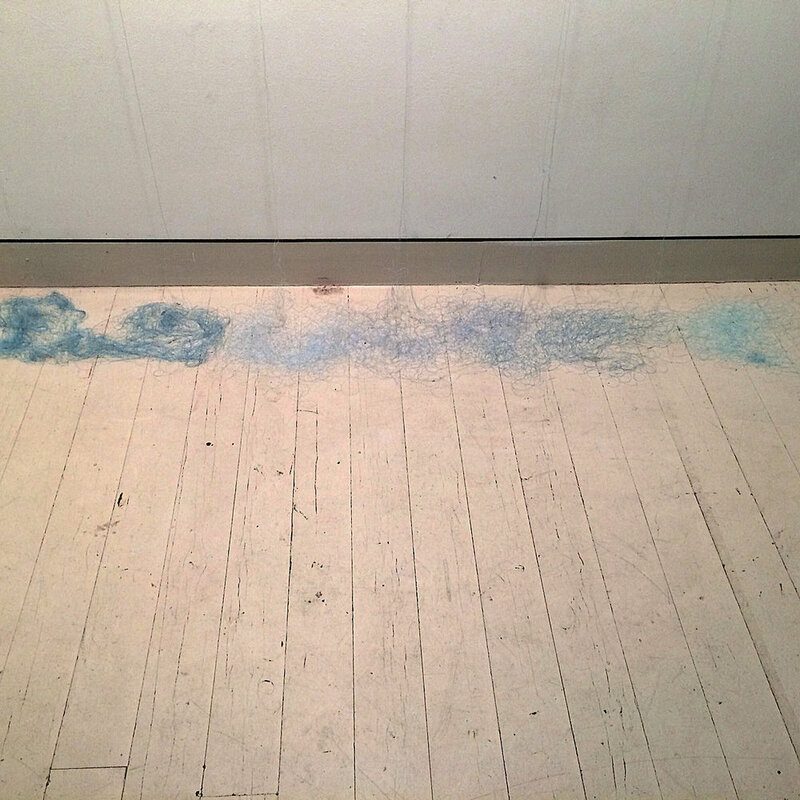 Susan Buret is a painter and installation artist living in the Southern Highlands of NSW. Buret has been the winner or finalist in several Australian art awards and has been artist in residence at Bundanon, Montsalvat, the Ragddale Foundation in Chicago and Cortijada Los Gasquez in southern Spain. Buret has exhibited throughout Australia and in France, Germany and the United States. Her work is held in public and private collections in Australia, New Zealand, Singapore the United States and Europe. 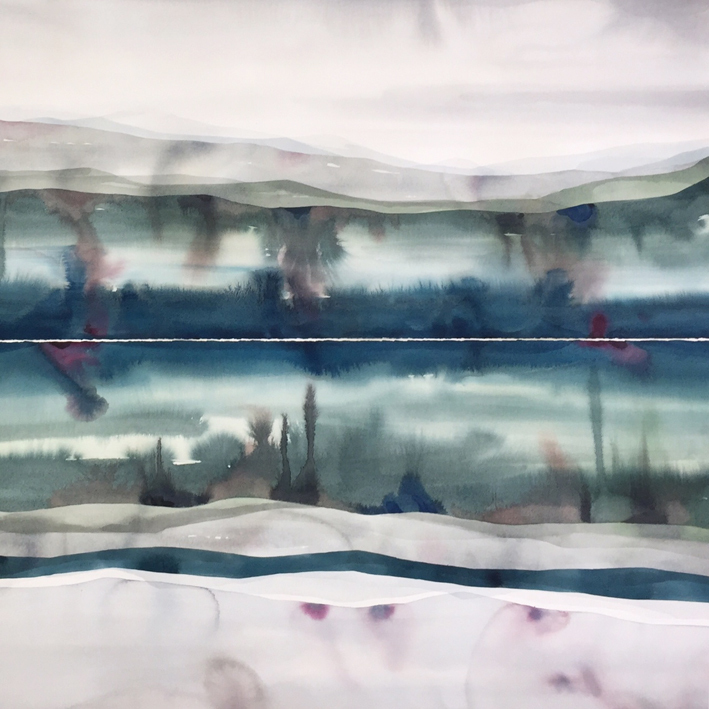 Julie Brooke is a Canberra-based painter and former biomedical scientist who investigates parallels between research in science and in the visual arts. She is a Research Fellow at the ANU School of Art and completed a practice-led visual arts PhD in 2013 for which she was awarded an ANU J. G. Crawford Award. Brooke was a Vice-Chancellor’s Artist in Residence. 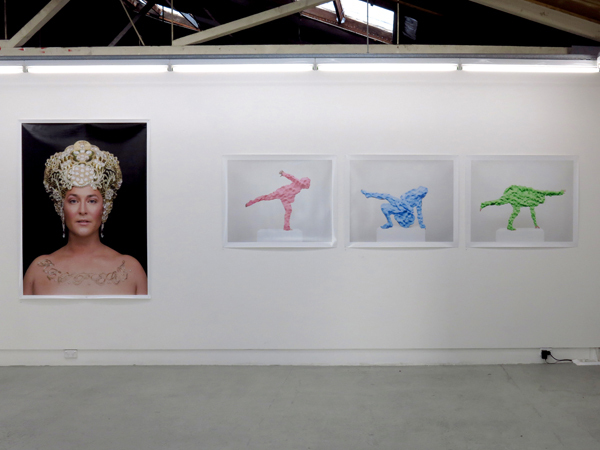 Through the use of both contemporary and classical modes of representation, artist Caroline Walls explores both the physical reality and physiological value of the female body. Walls endeavors to to critique contemporary ideas of women’s sexual and social identity in the current cultural sphere. The construction and complexity of the female identity, and the distinction between the private and the public self, are key themes of the work she produces. Notions of gender, intimacy and sexual fluidity are explored, often treading a line between the palatable and the perverse. Walls hopes to find information and beauty in places other than those we are accustomed to looking. Ultimately her body of work hopes to create a dialogue around a different kind of physicality, offering a response to the process of what we see and what we don’t see in others and the self. 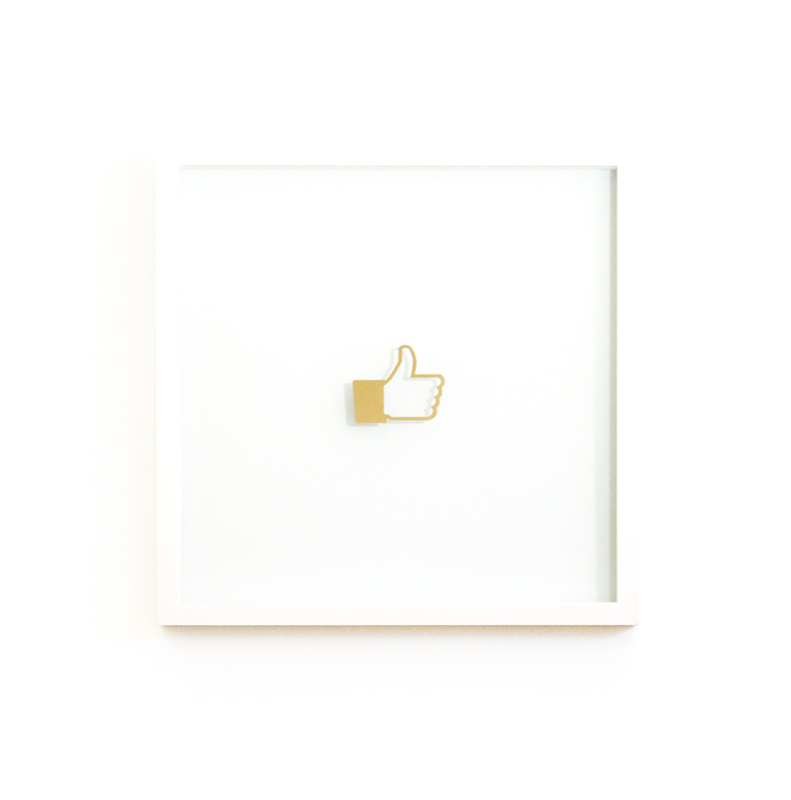 For the past several years, Ben Rak’s practice has explored the ways a consumer culture interacts with different aspects of every day life. Past projects have explored the relationship between consumerism and identity, sub-cultural affiliations, mass production, housing and domestic purchasing. 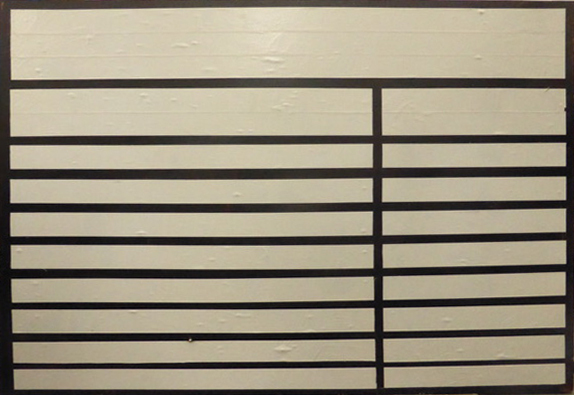 In Rak’s work, images are constructed through the printed grid of the barcode; the ubiquitous symbol of consumerism. They are transformed into a culturally significant pattern that repeats itself like cultural currency, translating complex cultural systems to a simplified version that are easy to digest. This transformation suggests an assimilation into one true culture, an order that seems to embody all people – consumer culture. 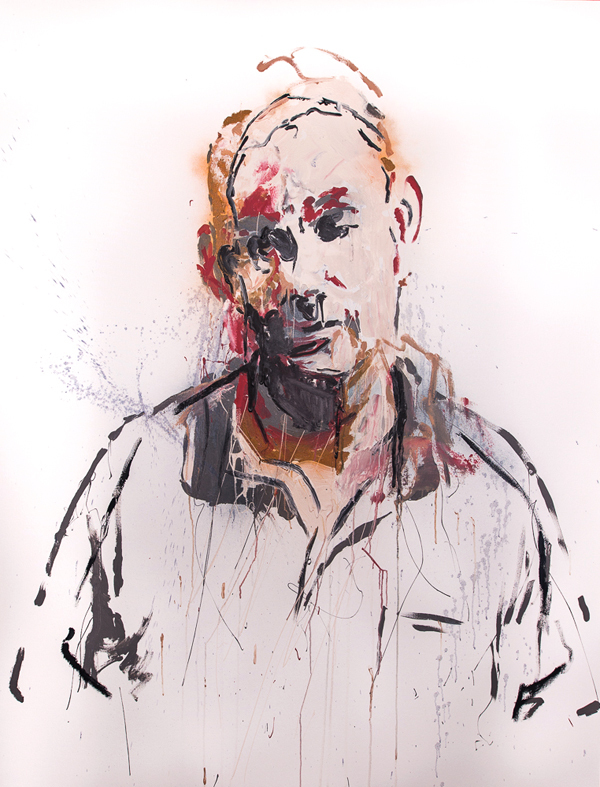 Rak's work is created across a diverse range of media, mostly those based on printmaking techniques. Many of these techniques were initially developed as commercial production processes. The artist's intention is to leverage their commercial aspect to further the conceptual rational of the content. For the Love of Colour brings together the diverse painting practices of Wendy Busch, Polly Hollyoak, Claire Lefebvre and Edward Niznik. These artists are intrigued by the diverse ways in which colour can communicate. This exhibition seeks to celebrate their differences and similarities as they investigate how colour can stimulate, alienate, intrigue, provoke and entice. The collaborative works created for this exhibition is the outcome of four disparate painting practices, creating hybrid works which question notions of authorship and challenges each artist’s individual practice. Parametrics are algorithmic principles that can be formulated to describe surfaces. In his latest body of work, Josh Foley combines rigid mathematical ideas to generate the illusion of painterly gesture. His paintings seek to uncover aspects of the material world and delves into the relationship between digital and non-digital environments. 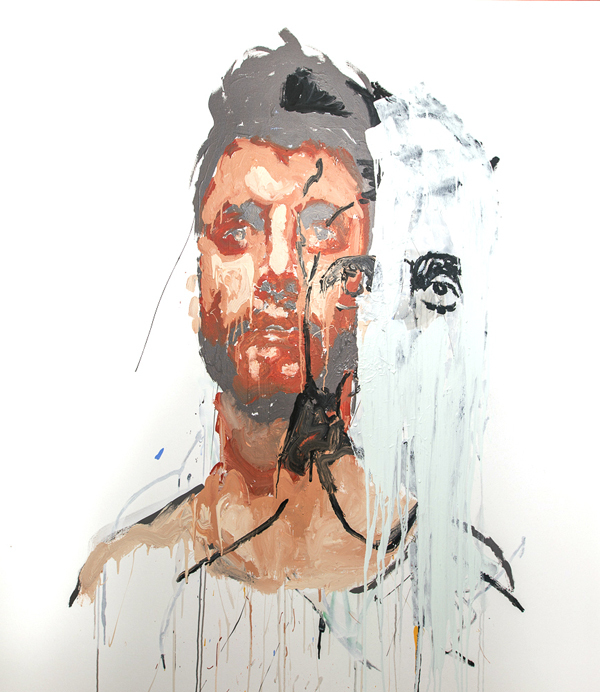 The painterly texture represented Josh Foley’s paintings is an illusion. That is to say, the surface of the painting is in fact completely flat. This is not evident if the viewer cannot observe the works ‘in the flesh’. This trompe l'oeil (trick of the eye) is not to deceive but to confuse the haptic expectations and bodily relationship with the viewer and the painting. PLASMO could be animal or vegetable, or it could be a world in itself. It is abstract, organic, anthropomorphic and living. It is playfully alien, yet eerily familiar. 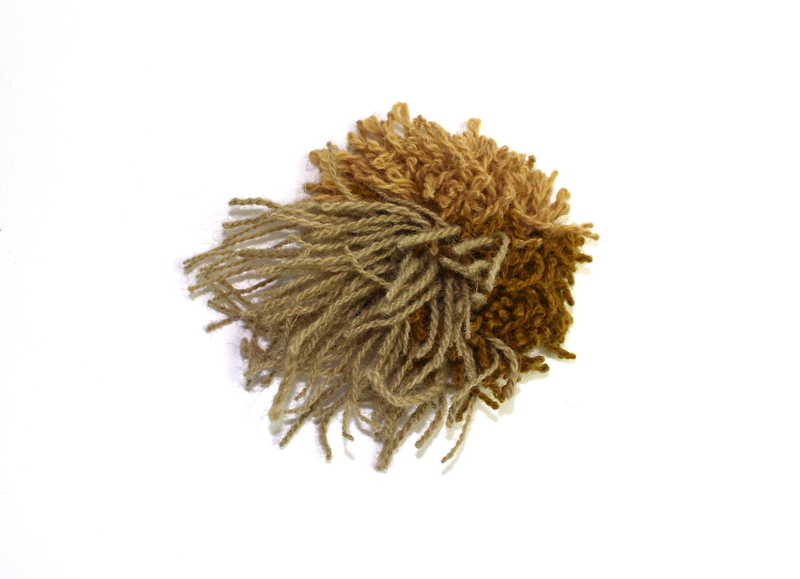 It alludes to the universality, micro to macro, of organic life and patterns in nature. 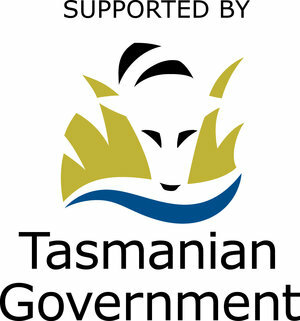 This body of work has been influenced by such patterns found while living and working in the unique landscape of rural southern Tasmania. Amanda Krantz considers her work to be organic-psychedelia. Works are familiar representations of ecology, but not quite of this world. Her process is underpinned by a playful exploration of materials, and questions the role of painter in painting creation. The method of paint delivery to canvas, is often in random pours, throws and squirts, employing forces of nature to mimic nature. The natural fluidity and reactivity of paint mixtures is alive in its own ability to move and mix, playfully creating chaotic patterns and random effects. Krantz acts as a facilitator, allowing the paint itself to capture the essence of time and place. It’s a scientific process, executed organically, creating science-fictional landscapes and quasi-alien life. The title Act One, Scene One, was something Hewitt’s grandmother said in her customary sardonic and resigned tone just before she died. She approved of the concept of multiple lives and had fond notions, which she expressed frequently, about how she herself was Cleopatra reincarnated. Although creative, passionate and eccentric, she was exhausted and trapped in an unhappy life, leaving it prematurely. Although for Hewitt, there is an inherent element of ode or dedication to her grandmother and matriarchal lineage, this body of work is not necessarily about death itself or the afterlife. Nor is the work driven by grief. Act One, Scene One encourages us to find acceptance in the infinite complexities of life and death. In this work, Hewitt seems to acknowledge the fear and apprehension associated with the perpetual shifts and changes that occur throughout life and the inevitability of death but these paintings urge us to ponder and even embrace these moments of transformation, growth, flux and the unknown. When Vowels Collide examines the coded construction of subjectivity and relates this to ideas of the performance of self. These investigations focus on inscriptive performance as an active form of power and social control. 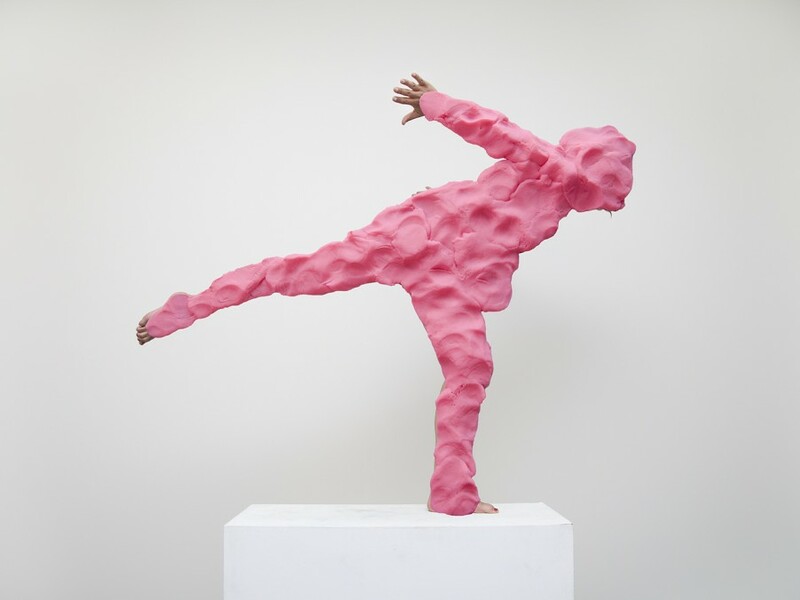 Carolyn Craig deconstructs gestural actions as tropes and stereotypes by utilizing her own body as the site of absurd action. The performative traces of these active gestures is recorded and inverted to query the basis of our everyday selves. The work asks the viewer to consider if these actions are based on biology or the privileging of entrenched systems of power. Text pieces infiltrate the performative traces and objects as a counterpoint to absurdity and as a navigational device into the subjective position. The materiality of printmaking, drawing and photography are critical to the artists attempt to rewrite her subjective position. 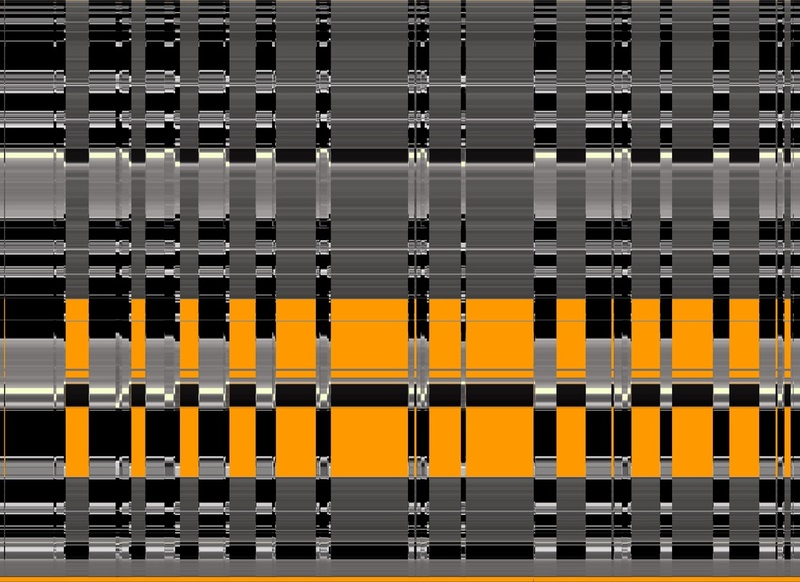 Each of these mediums contains the trace of self and the potential for active play within processes of inscription, recording, erasing and repeating. 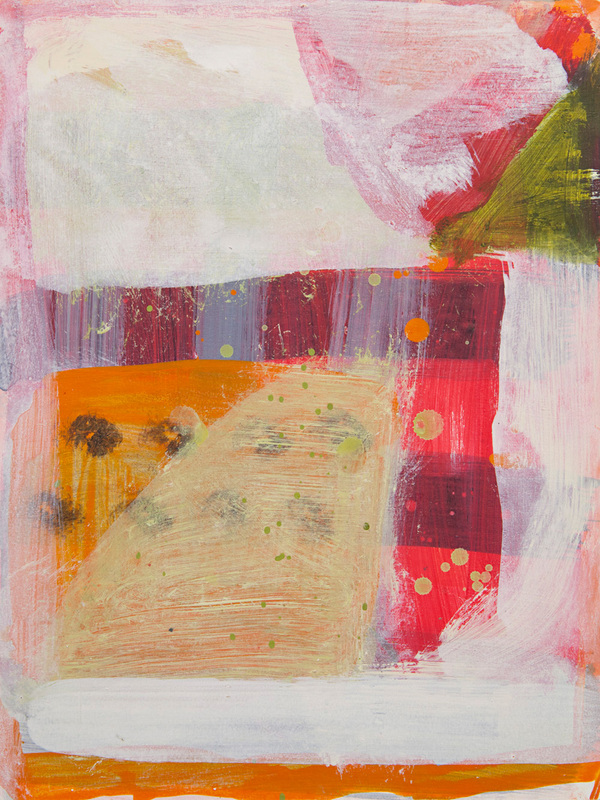 Sally Simpson’s work reflects her fascination with the way in which values and meaning assigned to land change over time, according to point of view, culture and situation. 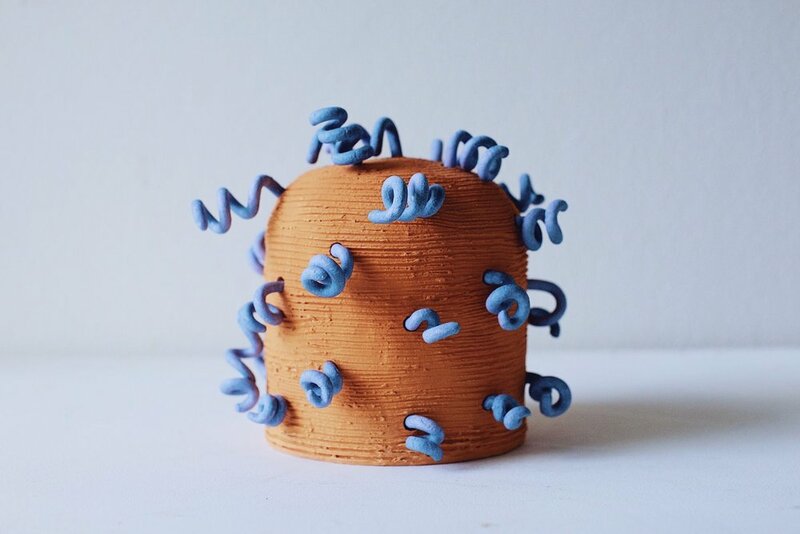 Simpson uses unexpected methods to transform natural and man-made materials found at particular sites, creating sculptures that evoke cultural artefacts and museum specimens, and drawings that reflect the fragility of an environment in flux. 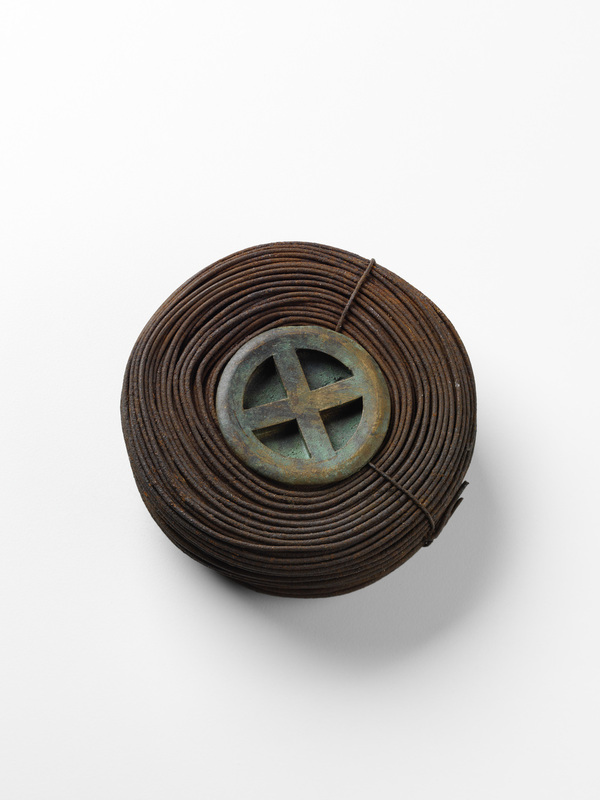 The purpose of these objects is to record the interaction between humans and the land at a particular point in history. Greer Adams Fine Art is delighted to announce the significant solo exhibition of work by the esteemed Western Australian Indigenous artist, the late Jananggoo Butcher Cherel (c.1920-2009). Jananggoo Butcher Cherel - Unearthed, showcases 14 historically significant paintings which, are some of the earliest known works produced by Jananggoo between 1989 to 1992. The paintings have been in private hands for twenty-five years. We are honoured to be sharing these important paintings with the art market, for the first time. “Someone once said that we are held captive by our biographies. From my experience, childhood plays a major part in shaping a life. I was fortunate to be pre-schooled by my Italian grandparents. This crèche specialised in teaching rural Italian knowledge and practices. They instilled a tradition of growing food, a connection to land, an abhorrence of waste and the activity of thrift. These experiences have been a life-long source of inspiration. As an art practitioner, I work across a range of media including installation, photography, sculpture and works on paper. I draw inspiration from nature; her colours, forms and cycles. A major part of my sculptural practice is to create new narratives with discarded materials. I am a composer, not of music, but of found materials. 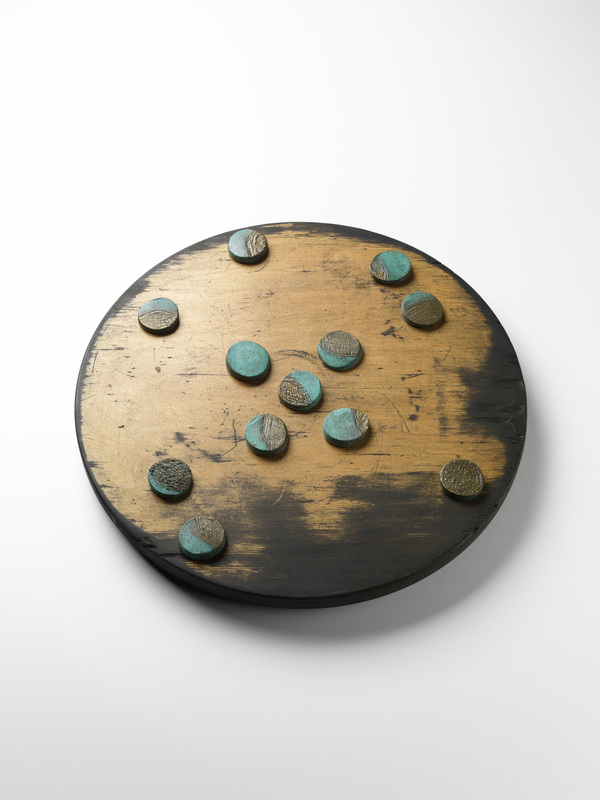 Recycled materials reveal the patina of time, but most importantly, they contain a human presence. I believe that an object’s history is latent – it may, or may not, be able to be seen, but you can feel it and I am compelled to work with these feelings. I use these possibilities like other elements of visual art such as contrast, line and volume. I strive for asymmetry, simplicity, the release of an innate essence, and the elevation of waste into aesthetic objects. 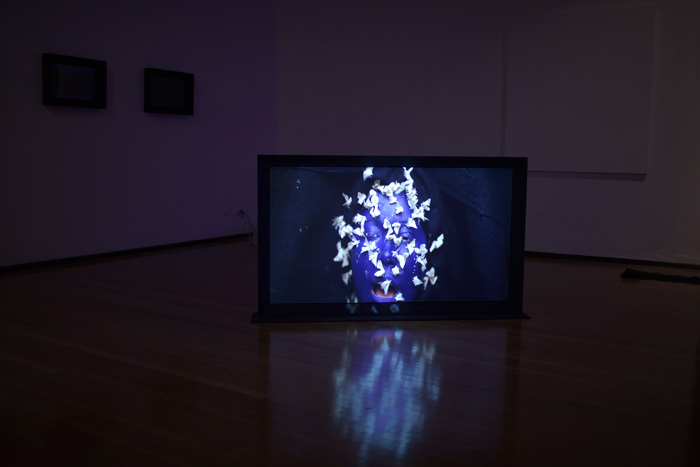 Between Heaven and Earth was developed through the continuing experience of Karin Chan’s cultural identity transition between Singapore and Tasmania. It references the reflection of Chan’s feelings that surround this process, in her ongoing investigation to explore physical and psychological spaces through new ways of engaging objects and their environment. 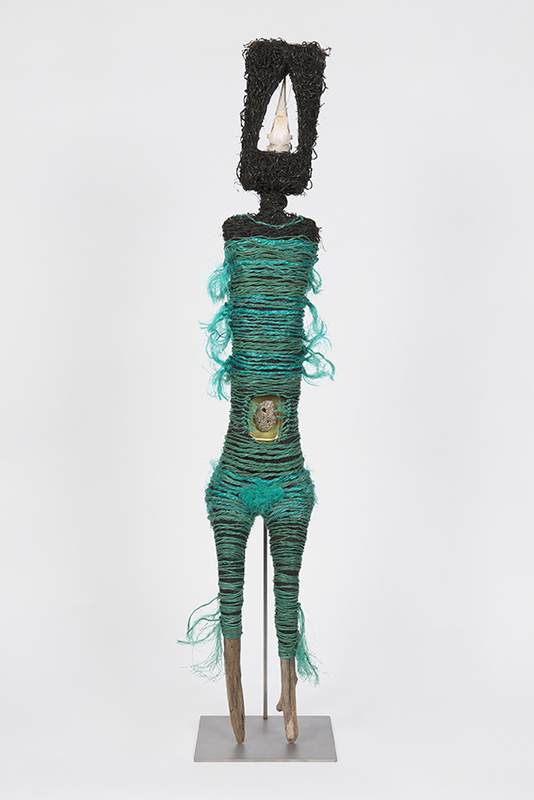 This work originated from a series of emotional vessels made out of the clothing of Chan’s late grandmother which was freighted from Singapore to Tasmania by her family. It reveals Chan’s reconnections with her loved ones and the revisitation of her intimate experience of nursing her late grandmother. Chan has transformed these personal materials as charged objects through engaging them in a series of activities which document her working speedily with them in her studio space. Chan tries to overcome the challenges of living & working in Tasmania by communicating her personal struggles to her late grandmother in this spiritual space - a divine space distanced from the reality of this physical world. Between Heaven and Earth is conceived as an ongoing source of energy for Chan to keep striving forward in the journey of the uncertainty. At the same time, it aims to liberate viewers in imagined spaces to experience the mystery of the unknown through the exchange between the artist and her family. PJ Hickman’s exhibition More Last Paintings features two series of paintings: MASTERPIECES and Blank Square. The eight MASTERPIECES paintings each feature the name of an Italian Old Master in the National Gallery of Victoria’s current exhibition Italian Masterpieces from Spain’s Royal Court, Museo del Prado. The series is painted using the same Dulux paint as the colour scheme originally selected for the exhibition (the curators ultimately chose to adopt a blue colour scheme). 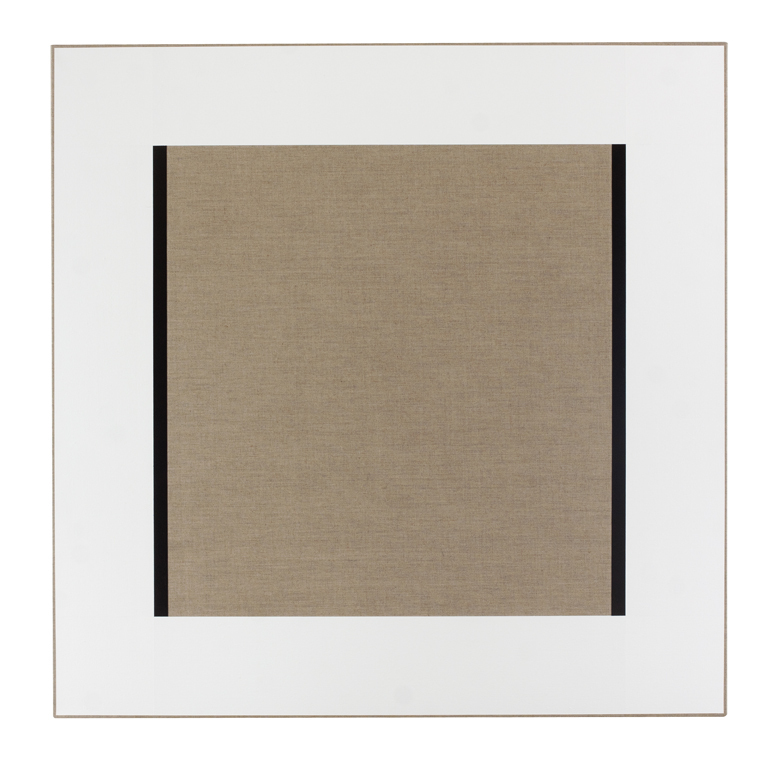 The four Blank Square paintings are the same dimension and composition as the early 20th Century Russian artist Kasimir Malevich’s four Black Square paintings. 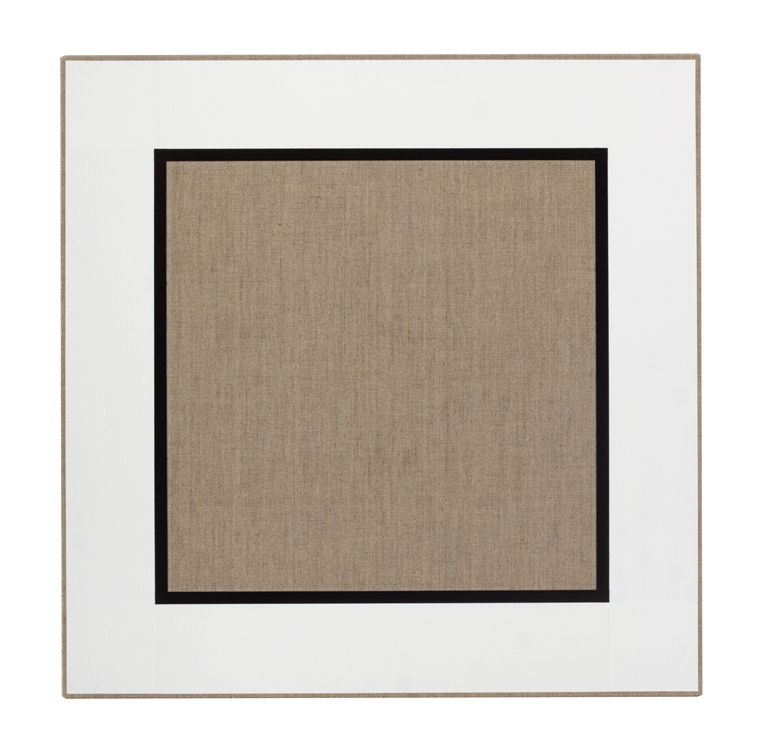 Subsequently ‘black’, ‘white’ and ‘square’ paintings have often been associated with reductive approaches to painting and its ultimate absolutist position. The paintings appropriate the artist’s names, the art world generally, and the context and function of the gallery itself. This appropriation creates a new situation and a new meaning or set of meanings unrelated to the specific artist named. The ‘Old Masters’ from the Museo del Prado and Malevich’s iconic ‘Black Square’ will be familiar to most viewers, and as such can evoke association with each artist’s oeuvre. Each series is an expression of pursuing an increasingly reductive aesthetic of simplification and repetition, with the same composition, format and materials. The paintings are essentially reduced to surface and materials, limiting the subjectivity of aesthetic decision-making and emphasising the rigorous economy and simplicity of the paintings. 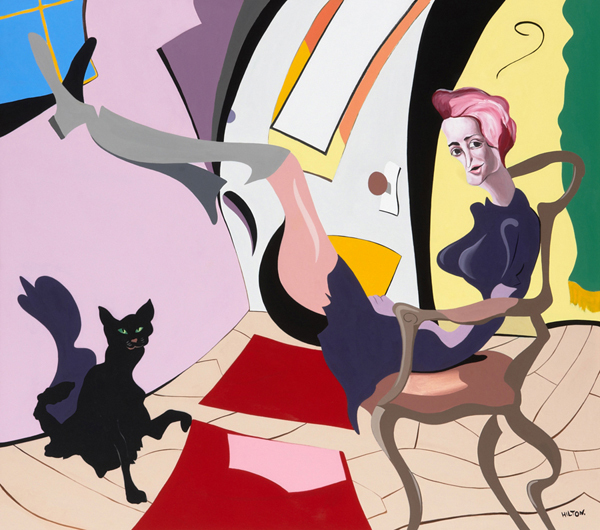 Rather than an “endless variety” of paintings, the standardisation allows an almost identical painting to be painted over and over – the last painting. UNVEILED marks the official launch of Gallerysmith Project Space located above one of Melbourne’s leading commercial galleries, Gallerysmith. 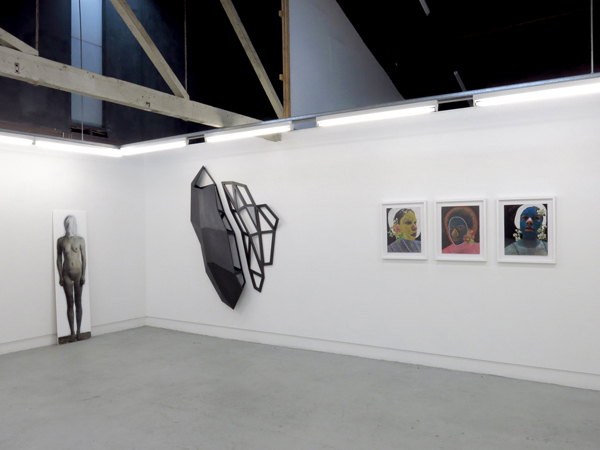 Gallerysmith Project Space offers a new model for connecting emerging artists with established collectors. UNVEILED features eight outstanding Australian artists who explore the way in which we use the exterior as a way of revealing something about what lies beneath. The artists curated into UNVEILED all use a form of masking to disclose or unveil something beyond external appearances. The mask is one of the most ancient expressions of human endeavour. The human body provides the individual with a vehicle to express themselves and contemporary culture presents innumerable iterations. By masking or concealing, the works in this exhibition evoke tactile and emotional responses, revealing cultural, psychological, emotional or physical truths and shed new light on the human condition. The launch exhibition opening night will include a live drawing/sound performance by Jon Tarry and Cameron Robbins and masks made for the event by Birgitta Helmersson. To view photographs from the launch click HERE! 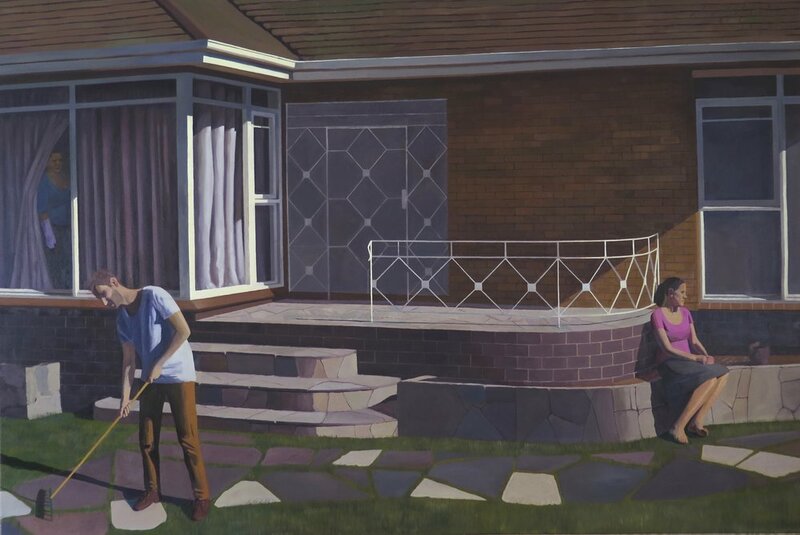 In his debut Melbourne exhibition New Paintings, 25-year-old Tasmanian painter Hilton Owen depicts people in scenes that would be familiar to most of us yet they have been executed with a unique twist. 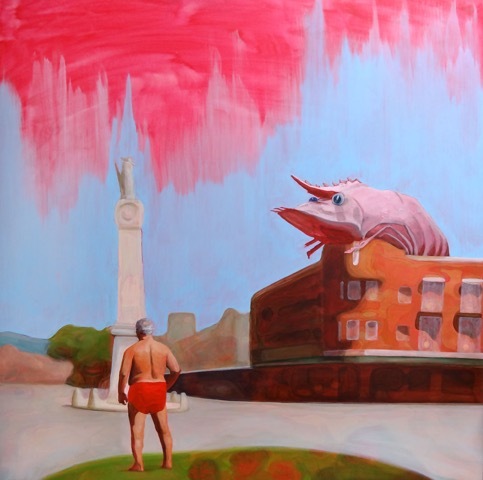 Hilton’s paintings depict everyday scenes of Western living. His subjects sit relaxed on a couch in their lounge room, or stroll through a mall with shopping bags in hand. However, the fluid and disjointed execution of the paintings suggest there are much more complex relationships between ourselves and our environments laying just beneath the surface.